This is the second chapter in my family history tracing the Cranwill line back from Australia and it includes Geoff and Virginia Rundle’s Family Trail of Ireland, August and September 2016. In 2014 I came across an old book that had been uploaded to the internet, called the Journal of the Association for the Preservation of the Dead in Ireland by the Rev. J Ffrench of Clonegal, which included a chapter describing the John Colley and Thomas Smith graves at Millenagh/Melenagh and linking their relationships. Excerpts of this book I have already placed onto my ancestry family tree and into my family history chapter, The Cranwill and Kilpatrick Families from Dublin, Ireland. The term dusty document explains how dusty old books, that have laid on the shelves in stately homes and public libraries are finally being rediscovered and uploaded to the internet. In some cases these books were hardly read and long forgotten, and left on a top shelf. The internet search engine is now providing the most amazing service to researchers because, by keying in a name it will bring up the exact page on these books, and this is how I found this reference to the Colley and Smith gravestones in Wexford, Ireland. It was at that very moment, sitting at my desk in Point Piper in Sydney’s eastern suburbs, I decided that I was going to try and find this graveyard and go on a bit of an adventure for my upcoming 60th birthday trip to Ireland. At the same time my husband Geoff and I were planning a trip to Ireland for a holiday to further research our Irish ancestry by visiting the counties where they had lived before their migtration to Australia. On Geoff’s side there were the Farrell, Cuffe and Griffin families, and on my side, there were the Wise, McOboy, Murray, Cranwill and Kilpatrick Families. 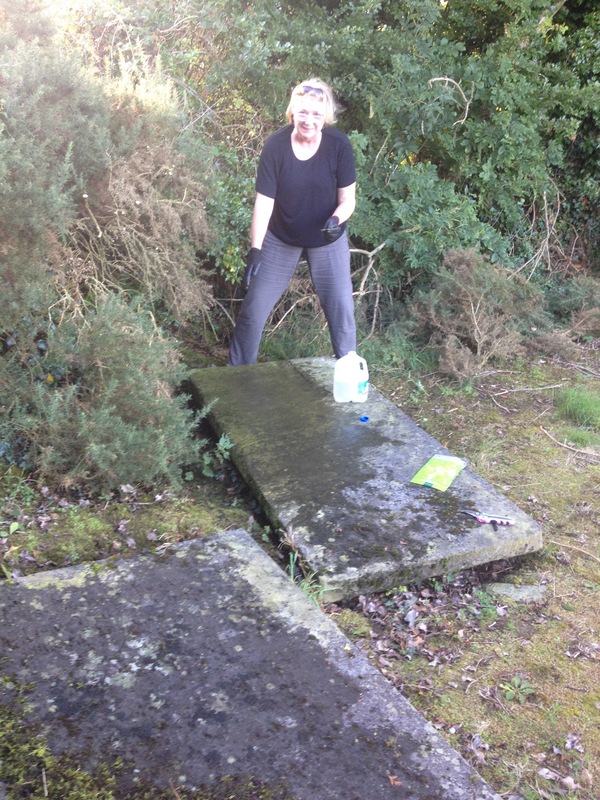 I was determined to find the ancient graveyard of Melenagh, and uncover for myself these long lost graves of the Smiths and Colleys, even if it meant an archaeological dig! I put aside a week in Wexford for this task. Before my trip to Ireland I identified a site called Melenagh from Google Maps and compared this with an old 1813 Map of Wexford mentioning Melenagh, which was kindly emailed to me by Rosemary May. Overlays of the two maps confirmed that even after 200 years the road systems in this area were very much the same. From Google maps I could identify three areas of interest that appeared to be disturbances on the ground, possibly indicating a graveyard. It was incredible that I was able to narrow down my search areas, before I had even left Sydney. With the assistance of a Google hot spot, kindly uploaded to my iPad by my son Rowan, when he uploaded Google Maps, I was ready for my adventure. A hotspot is a satellite identification showing your exact position on Earth, which then shows up on Google Maps, moving along on your map as you drive. 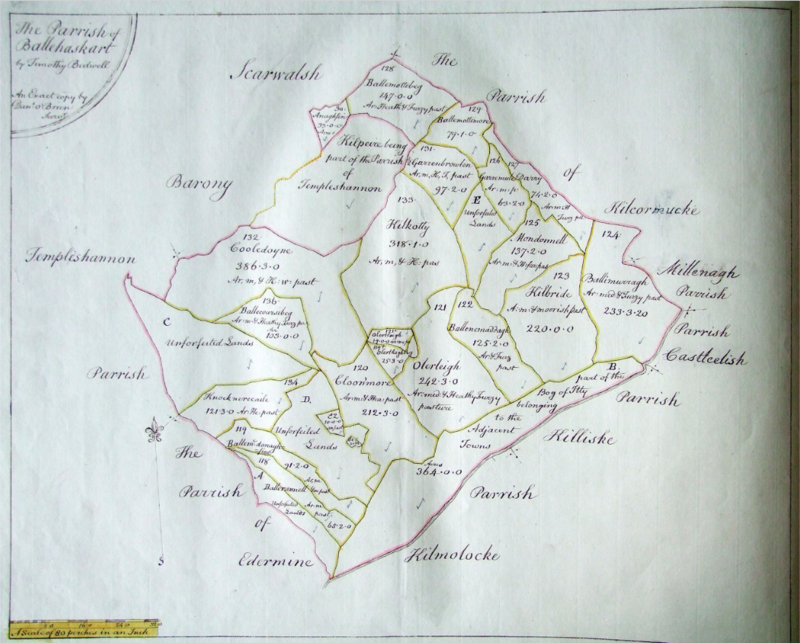 I had studied the whereabouts of Melenagh/Millenagh/Meelnagh from several old maps, including a parish map and an old historic map showing key sites from The Wexford Rebellion of 1798 and looked at the names of the towns and homelands and noted slight changes over the years to their spelling, but saw that all the roads were still roughly the same. 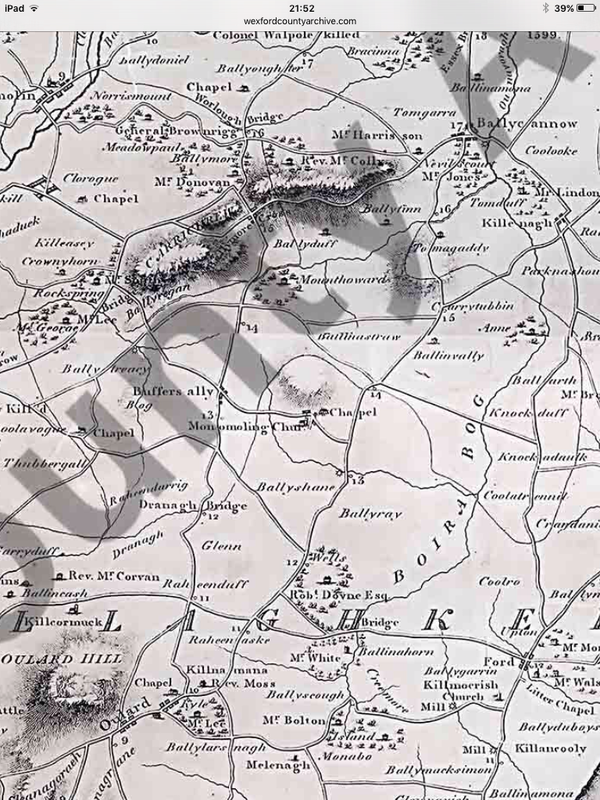 When superimposed with Google Maps, the Wexford Rebellion Map of 1798 was strikingly similar to today’s Google map of the area. The important places of note, which helped narrow my search, were Killmocrish/Killmuckridge, Ballyscough and Melenagh/Meelnagh. The next illustration is of an old Parish map, and further into this chapter are two more maps showing Melenagh/Meelnagh. 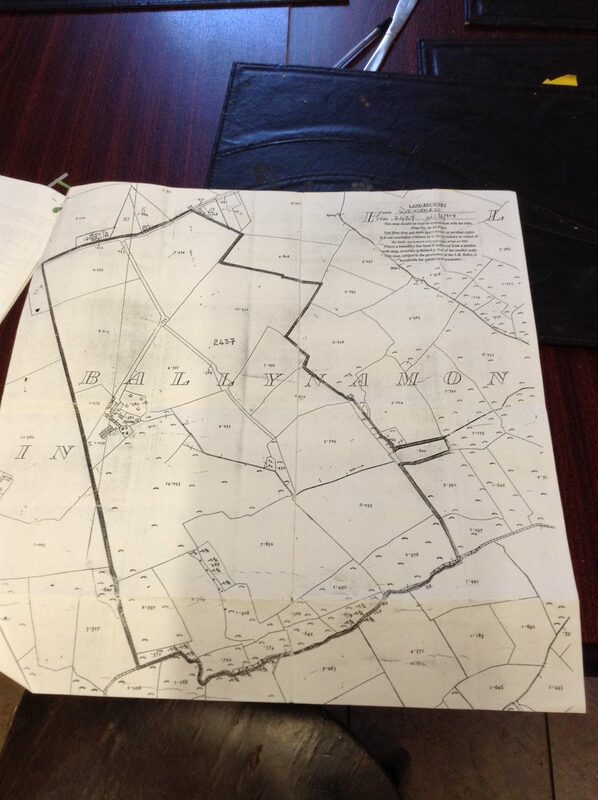 I also studied three Irish Ordnance Maps from 1824-1846, pages 22, 28 and 55 which covered an area from Ballycanew in the north to Melenagh in the south of Wexford. Page 1 of the collection shows the grid maps, and from this I was able to find most of the early place names that are mentioned in the Colley, Smith and Cranwill documents relating to my ancestors. Whilst in Gorey in Wexford, Geoff and I went shopping at Aldi for some strong gardening gloves, secateurs and a stiff broom. We also armed ourselves with several plastic bottles filled with water, to aid with cleaning the graves so we could read the transcriptions more specifically. 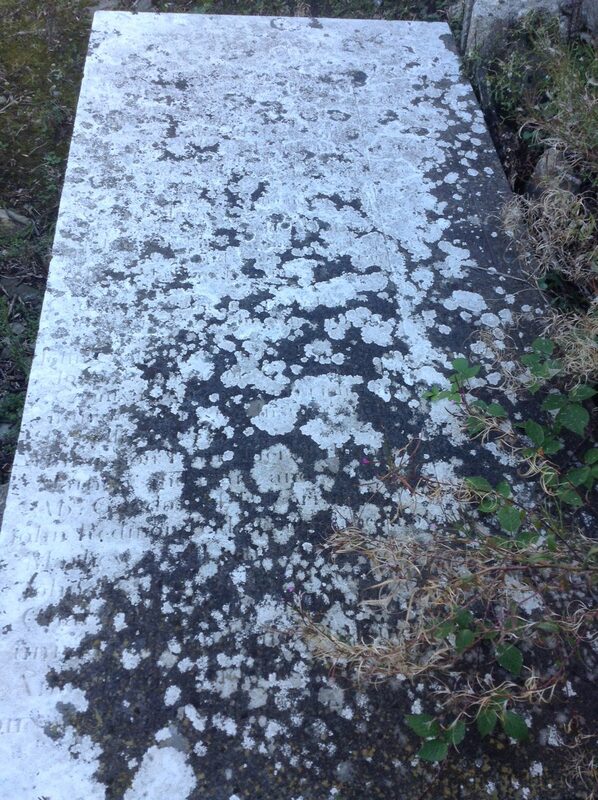 We had already been to County Cork and found two Wise graves outside St Anne’s Church at Shandon in Cork city, and knew how helpful water was in bringing the writing up more clearly on these old gravestones. However, chance dictated that Geoff and I would visit Ballycanew and St Mogues, before we set out for Melenagh/Meelnagh. From our B&B near Gorey, Google maps showed that the most direct way to Melenagh led us southwards through the township of Ballycanew. 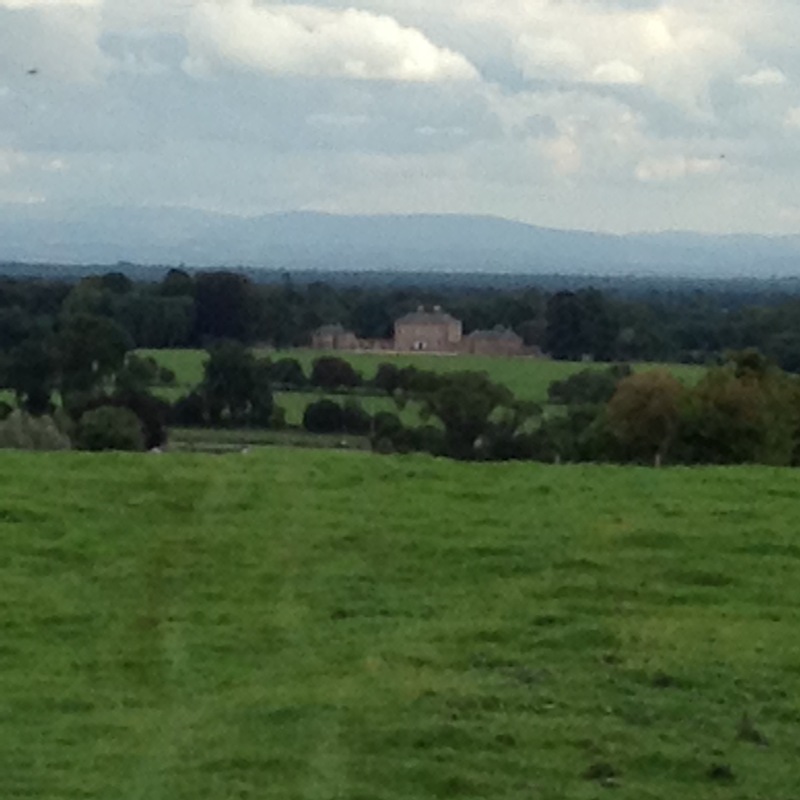 As Balleycanew came into view, I could see St Mogues Church immediately on my right. 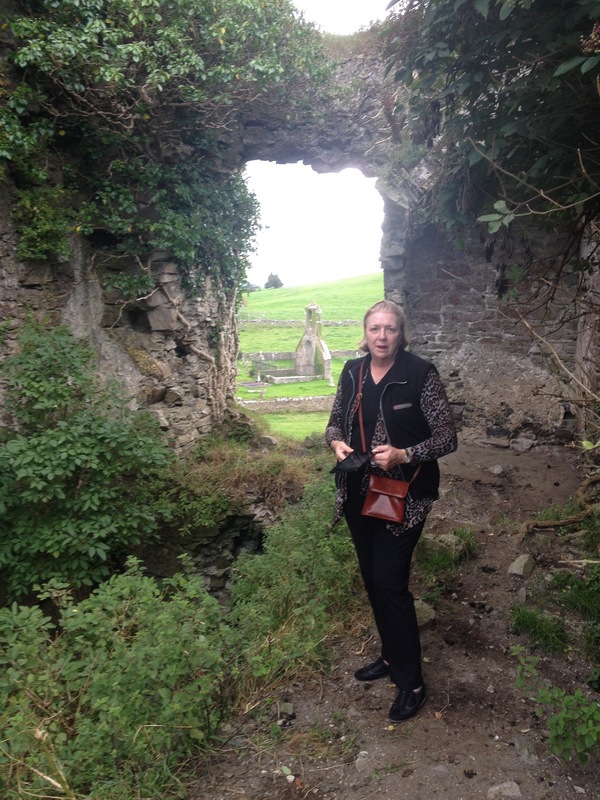 Naturally we stopped for a look, as Ballycanew was one of the iconic sites that I wanted to visit on my trip. 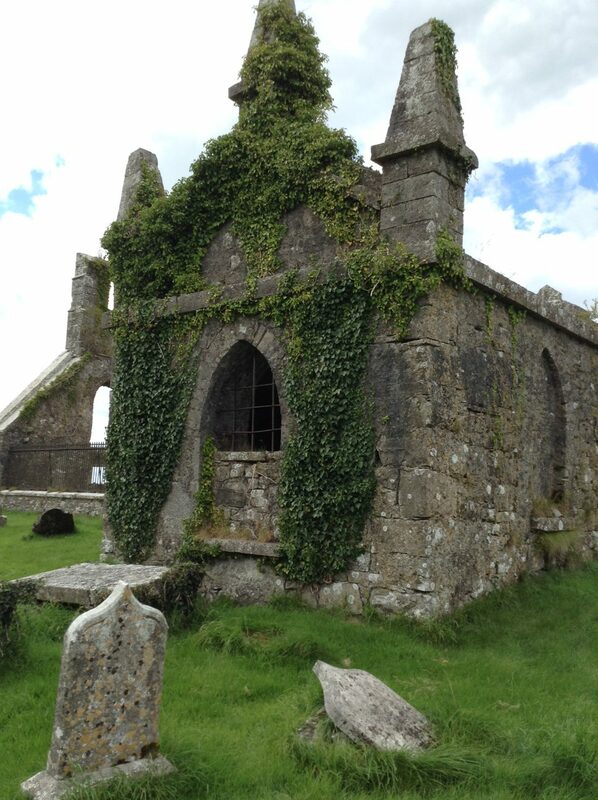 This church contains the records and graves of my early Irish Cranwill ancestors. 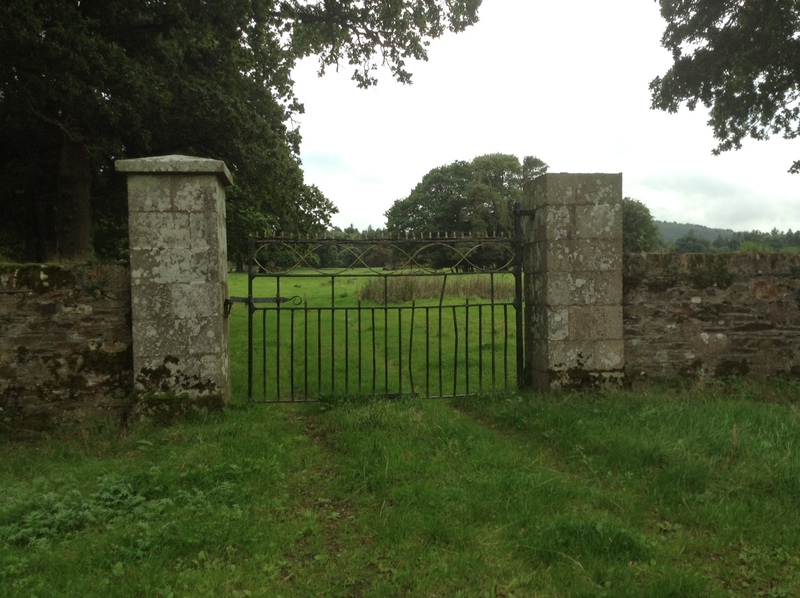 On our arrival at Ballycanew on Monday 5 September 2016, Geoff and I parked directly outside the church, and we saw that the gates were locked. I was a bit dismayed, considering how far we had come, but I was not daunted. It was my 60th birthday, and in the glorious sunny weather, I was feeling happy and confident. I decided to visit the petrol station next door for help, and was greeted by a friendly attendant who told me to go to the Post Office, which was on the other side of the store; he was sure that they had a key. I was excited, and in quick time, a kind woman in the Post Office confirmed that the key to the church was kept directly across the road with Mary Rathwell. Apparently, Mary was almost always at home. Again, I was on the move, crossing the road to the large white house on the opposite corner. Mary Rathwell was home, and it is a moment that I will never forget, meeting the delightful and smiling Mary, who greeted me so warmly. She told me straightaway that her home was formerly the home of my ancestors, the Cranwills. It was incredible how things were unfolding. 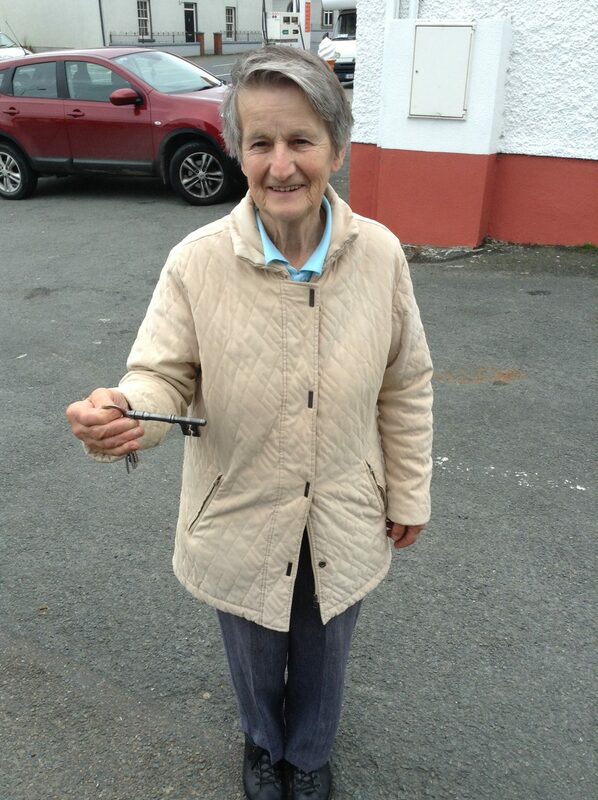 Mary took me back across the road to St Mogue’s large gates, and took out an ancient and very large key for the gate. 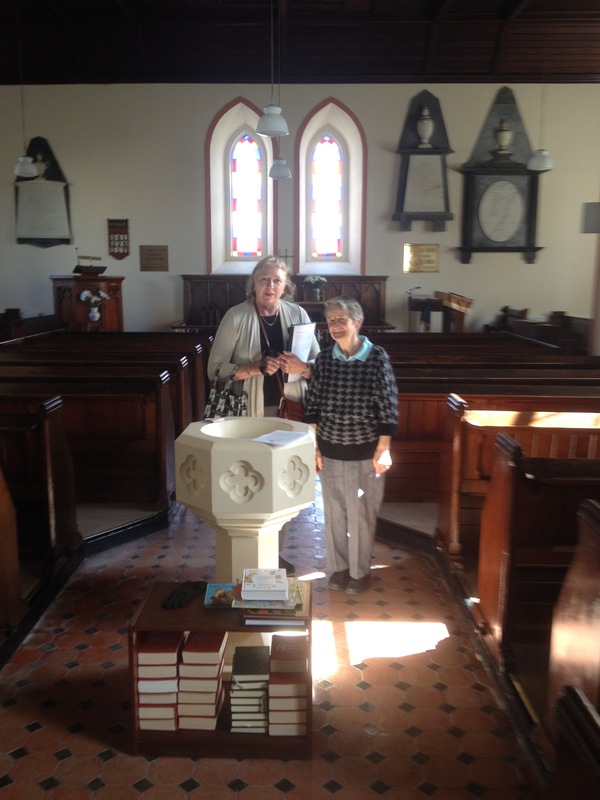 Mary then invited us into the church and later into the Vestry Office, where she allowed us to look though St Mogue’s Vestry Book and the Births, Deaths and Marriage Records, all the while telling us amazing stories about St Mogue’s Church. I wished I had more time, but I took as many photos as I could and absorbed as much information as was conceivable. Geoff was also taking photos on his phone of other parish books so we could cover as many records as possible for our family. We were mainly looking for Cranwill, Smith, Colley, Eades, Johnston and Tackaberry records and we were not disappointed. John Colley of Belcarrigg, Esq. I had only seen excerpts online of the St Mogue’s Vestry Book. The addendum at the end of the vestry book gives a list of those buried in the churchyard, and it was with considerable consternation and excitement that I saw that Thomas and Dorothy Smith were listed in this book. At first I didn’t understand the significance of this entry. 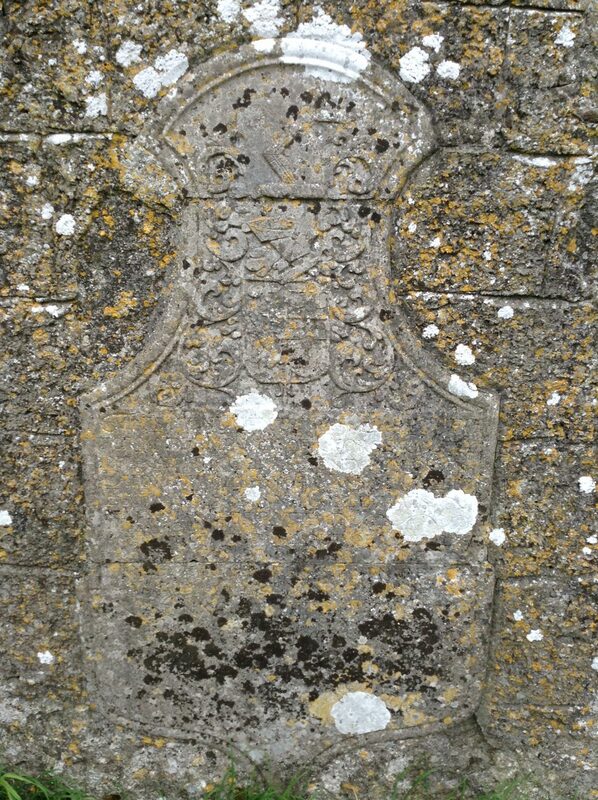 I mentioned to Mary that I found church fonts to be very symbolic for our family, knowing our ancestors had been christened at St Mogues, and asked, if she knew how old it was? 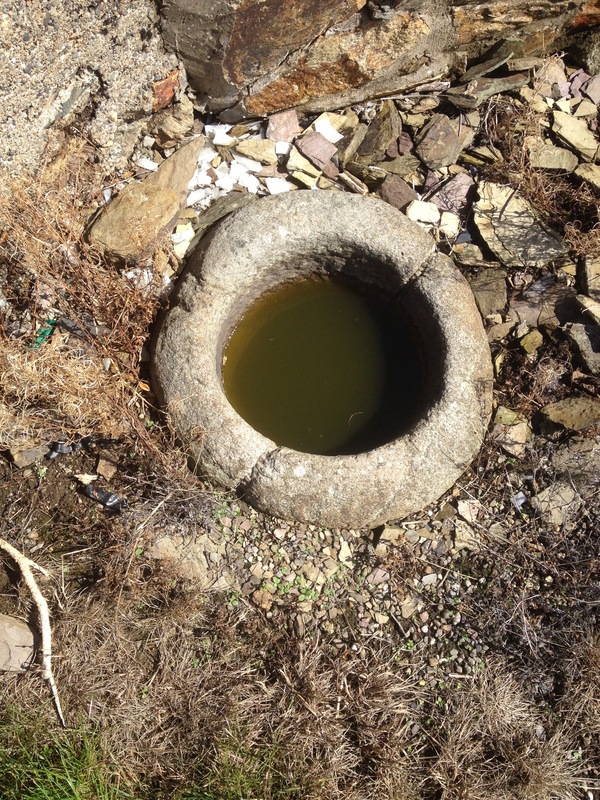 Mary then told me this story about an ancient font out in the churchyard, and I asked if I could see it. We went out the back door of the church to see the old font. I was so intrigued and couldn’t help but draw a parallel to the Ffrench story in his book about the old font in the churchyard. Geoff, who by this time was already combing the headstones, was also struck with the similarity to the Ffrench book. 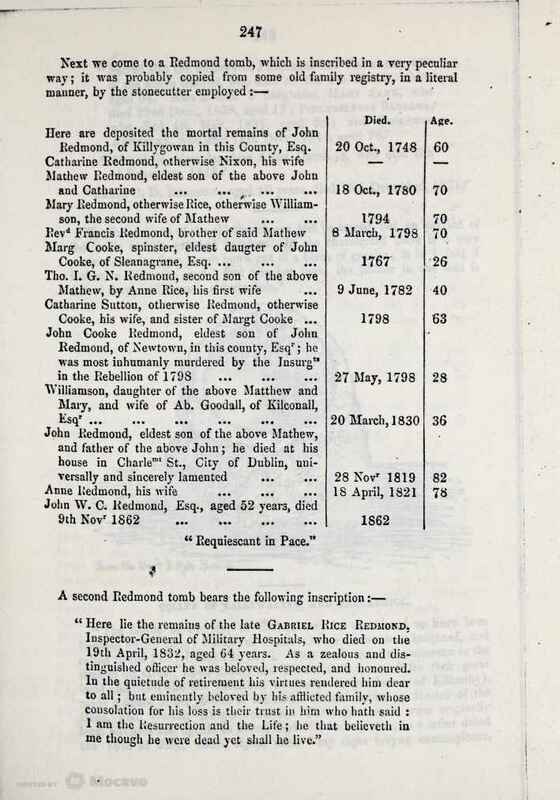 I was wondering if old fonts were regularly placed in the back of churchyards, or that there was some connection with this font to the Ffrench book? Geoff used the broomstick we had purchased in Gorey, and he measured off the depth and circumference and compared it to a credit card from his wallet, which was marked with inches, and he was able to confirm Rev. Ffrench’s dimensions pretty almost exactly matched the measurements from his book. Now that I was in the churchyard I decided to look about for the graves of Peter Cranwill and his son Joseph, whom I knew were buried in the churchyard, and recorded in the surviving Parish book records. I knew this was a long shot because in the 1950’s it was recorded that the Cranwill gravestones were very weathered and hard to read. 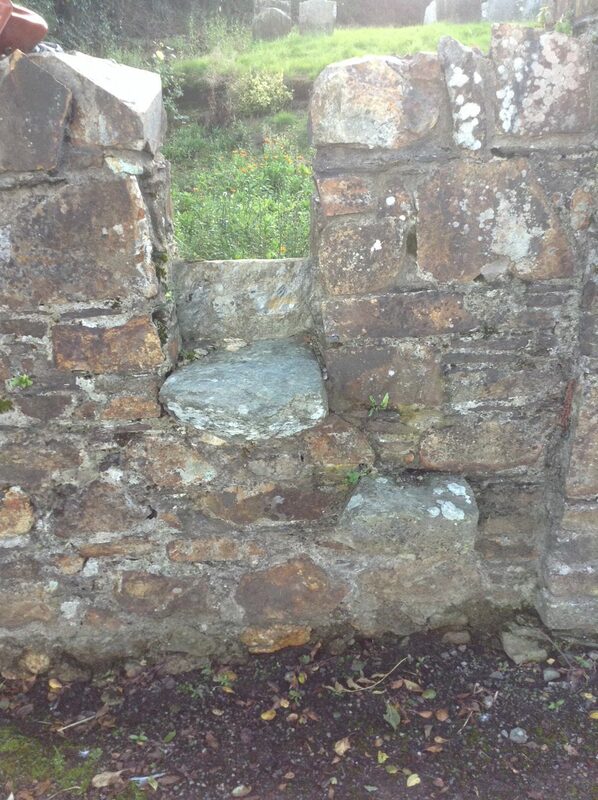 I had no luck, and ended up near to the entrance to the church and nearby to the surrounding wall. In the strong sunshine that morning my eyes spied the name Colley on a gravestone and intrigued I went in for a closer look and there, most astonishingly I found the name Dorothy Colley, otherwise Smith named on the grave. It was as exciting as it was confusing, as I was meant to find this grave at the Millenagh/Melenagh churchyard. It would be extraordinary for there to be two gravestones. Next to Dorothy’s grave was another similar black granite flat grave, and I decided that they were a pair. 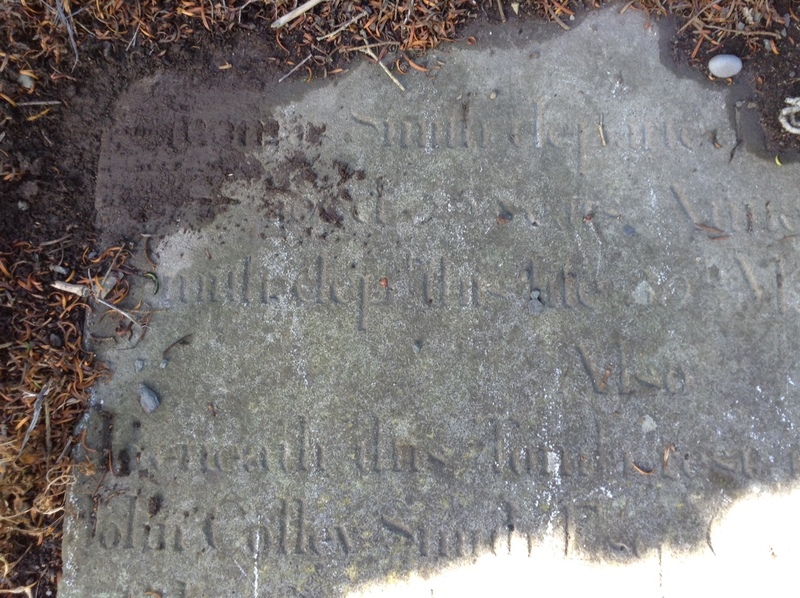 On looking at this grave more closely my blood ran cold with excitement, unmistakably I could read the name Smith at the top, and John Colley Smith was written clearly further down the gravestone. 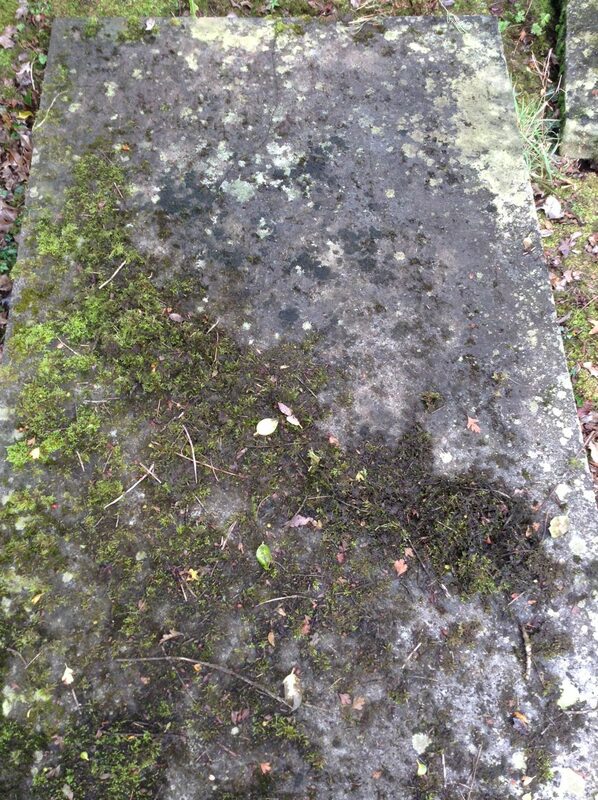 Soil and leaf matter concealed the corners, as well as a fallen grave on the right hand side, however, I grabbed my gloves and scraped away the soil to reveal the name Thomas Smith at the top of the grave. 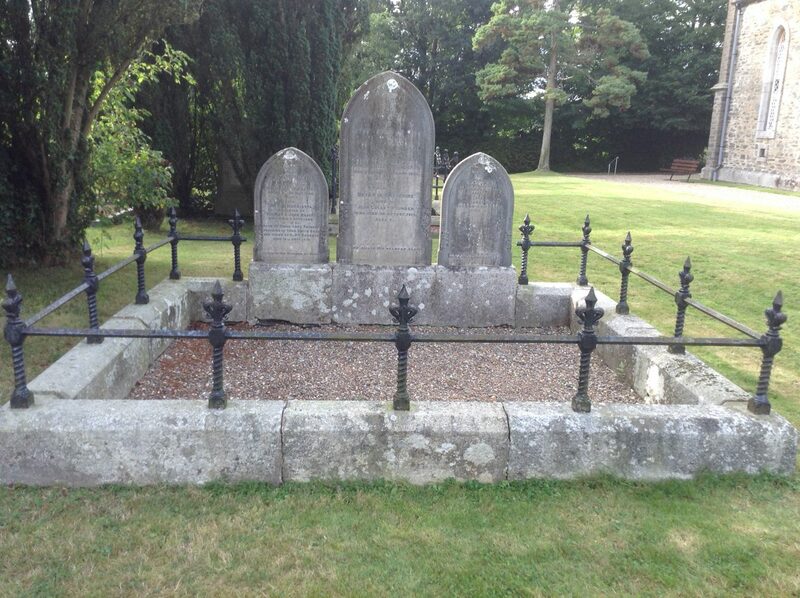 I had found my 5 x great grandparent’s graves, lying side by side! It was the best birthday present I could ever have! 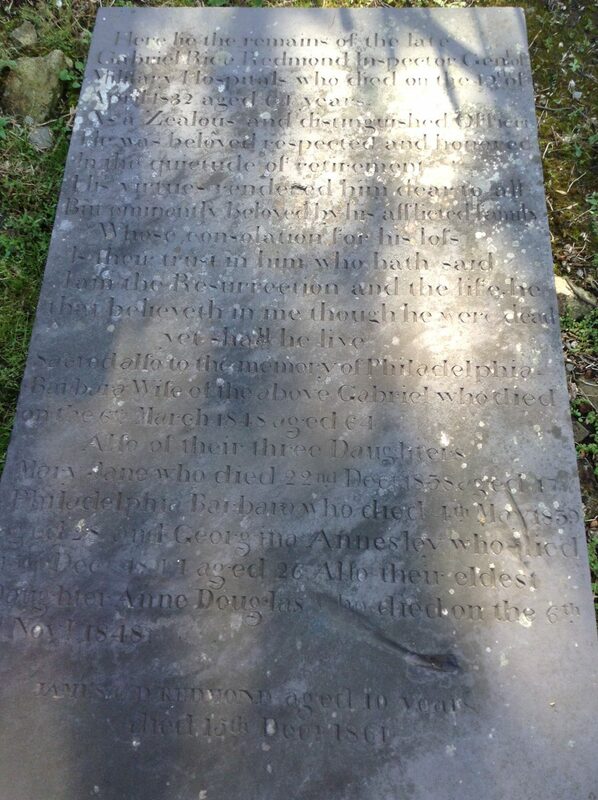 This day, 5 September 2016, I had discovered that their magnificent and impressive ledger gravestones had lasted the test of time, until I could come and read this inscription and definitively know that this was probably the most significant discovery I had ever made in my family history quest. It was overwhelming as it was significant, confusing as it was momentous. The photograph above is exactly as I found the gravestone, apart from having to lean under a tree to take this photograph; it was quite incredible that I spied the name Colley in the Autumn sunshine in Wexford. 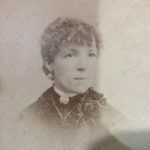 This is an incredible recording of our family tree and this experience, apart from my confusion, was filled with elation and gratefulness that I had found the Smith grave at Ballycanew. Later, I clipped away the foliage to reveal the full inscription. Next to Dorothy Colley otherwise Smith I found myself reading the next grave inscription. 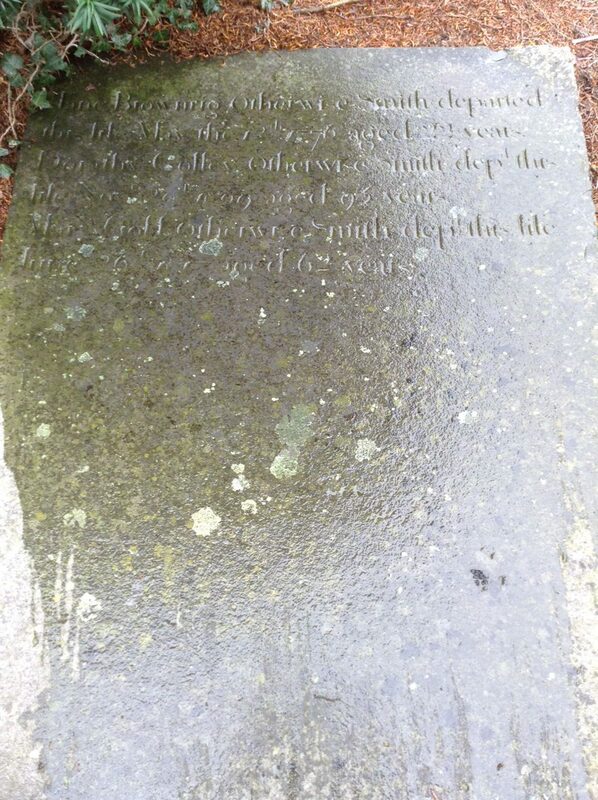 This grave was so interesting, and the wording was so familiar to me, but my brain was telling me that I was meant to find this Colley grave in Melenagh, not in Ballycanew. What was going on? It was totally confusing to me – just as I was as confused about finding Dorothy Colley mentioned on the grave next to this grave of John Colley Smith’s, I spied the name Smith at the top as well. And with trembling hands I pushed away the soil and grasses and there in front of my eyes I uncovered the name Thomas Smith! Incredibly, this was the gravestone of my 5 times great grandfather, Thomas Smith and his son, John Colley Smith, and somehow his wife Dorothy Colley nee Smith, was in the grave beside him with two other women whom I didn’t know anything about. Reading further was just as confusing, Ann Brownrigg otherwise Smith was buried in the grave with Thomas Smith as well. I was wondering were there two graves, one at St Mogue’s and one at Melenagh? 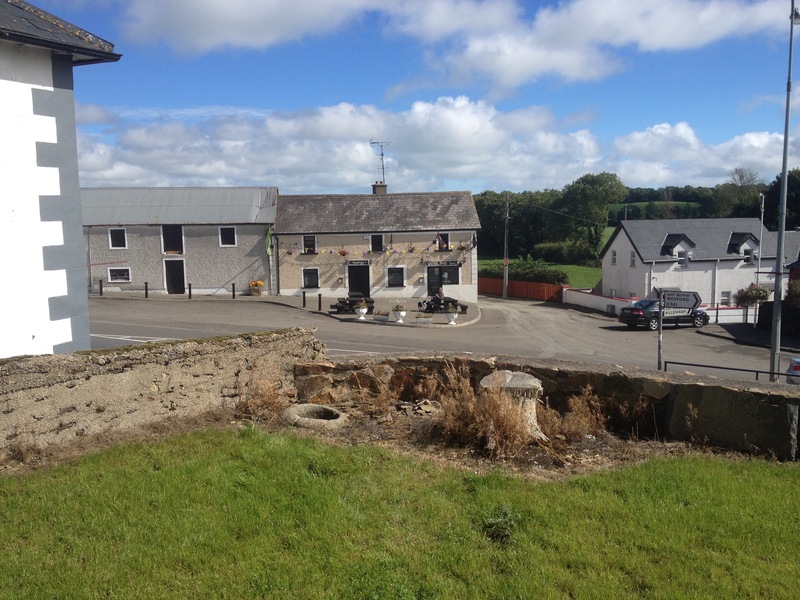 I was supposed to find the grave of Thomas and Dorothy Smith at Melenagh. And who was Ann? Working out the dates, she was 80 and he was in his mid 50’s, so it would see that Ann was probably his mother. How did this then place the Rev. Ffrench’s research, documentation and the printing of the book mentioning Melenagh? I was beginning to think that Ffrench had made errors between his field research and writing it up. These were the days before the camera, his recordings were done laboriously by copying by hand, so it is possible that some research was confused. His research was well done, as accurate as possible, however, back in his study he did not have the advantage of photographs to confirm his findings. Mistakes were sure to happen. Gravestone of Thomas Smith, his son John Colley Smith and mother Anne Brownrig otherwise Smith. 20th day of March 1837, aged 90 years. 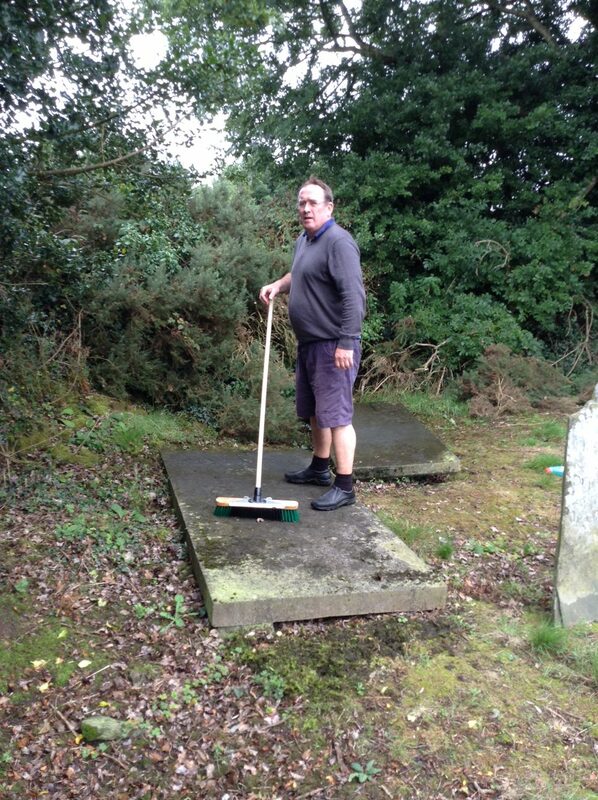 Geoff and Virginia Rundle cleaned and applied water to the graves in order to read the gravestones. It is remarkable how well the inscription comes up after this treatment. 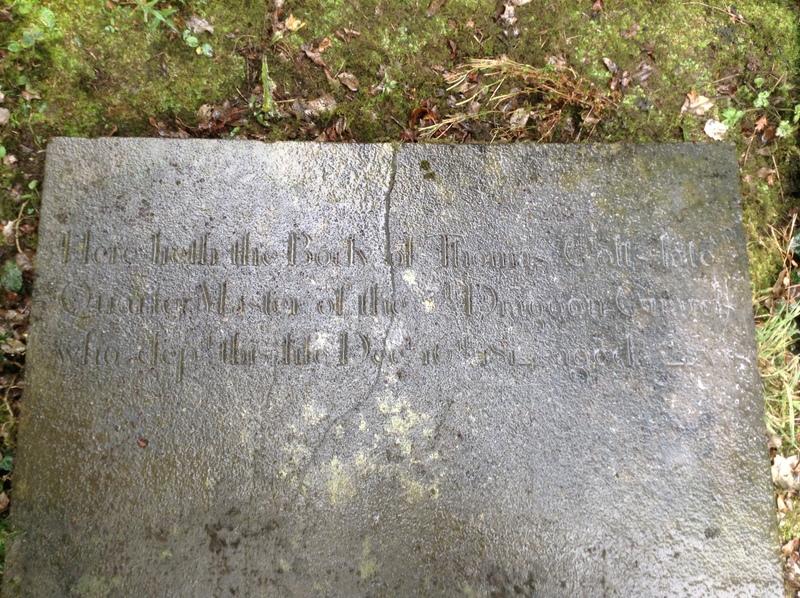 John Colley Smith, Captain in Command of the Camolin Cavalry is indeed buried with his father, Thomas Smith, and I believe the other person buried in this grave is Thomas’ mother, Anne Brownrig, otherwise Smith, incorrectly transcribed in St Mogue’s Vestry Book as Brown. In the other grave I believe this to be Thomas Smith’s wife Dorothy Colley otherwise Smith buried with Jane Brownrig otherwise Smith and Mary Goff otherwise Smith who are buried in the left hand side ledger grave. 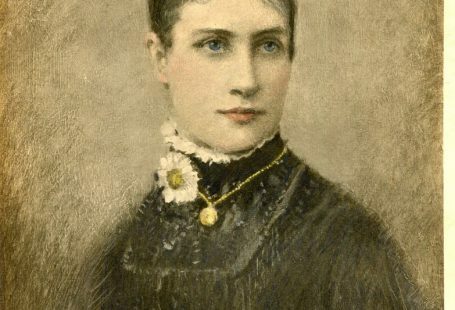 There is no explanation for Jane Brownrig otherwise Smith, who was married to a Smith relation, however she died shortly after her marriage, at the young age of twenty-two. Mary Goff otherwise Smith is possibly a daughter in law to Thomas and Dorothy Smith. It is possible that Jane, who died young was the first wife of John Colley Smith. John then married her sister, Anne “Hannah” Brownrigg, they were the parents of Thomas Colley Smith. 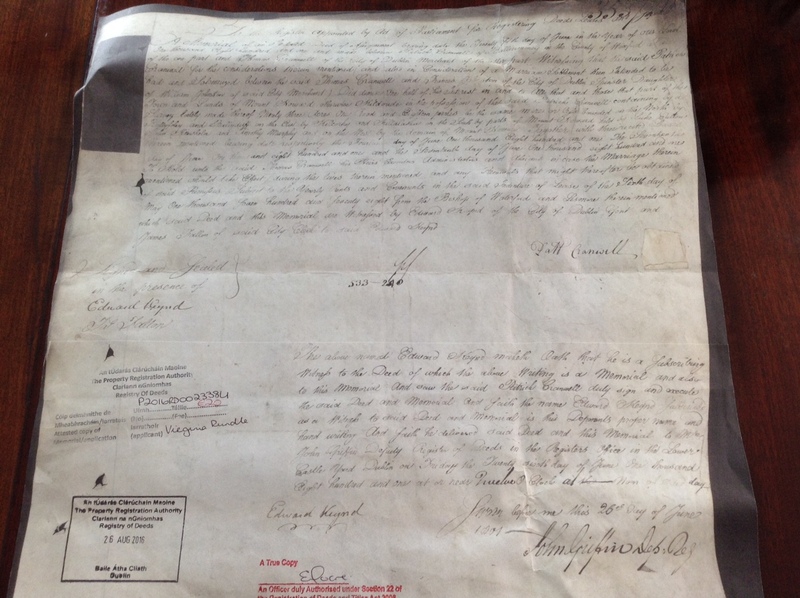 This document was an absolute gift to the family researcher, now I had both the Smith’s grave and their marriage licence listing, not only that but there were plenty of other known Colley marriage licences to work out and place into my family tree. There are several ways to spell Millenagh/Melenagh/Meelnagh, and this has come about with changes to the language over the centuries. Google maps spells it Meelnagh if you are want to look it up. As Geoff and I left Ballycanew and drove southward in our quest to find Millenagh/Meelnagh, I could see our exact position on the map on my iPad, thanks to the hotspot satellite. Amazing stuff really, because when we rounded a corner near Melenagh I said to Geoff, that coming up on the RHS is my first area of interest, and looking up from my IPad, I spied a very old brick wall and then saw headstones, and I knew we had found the graveyard at Melenagh without even leaving our car! 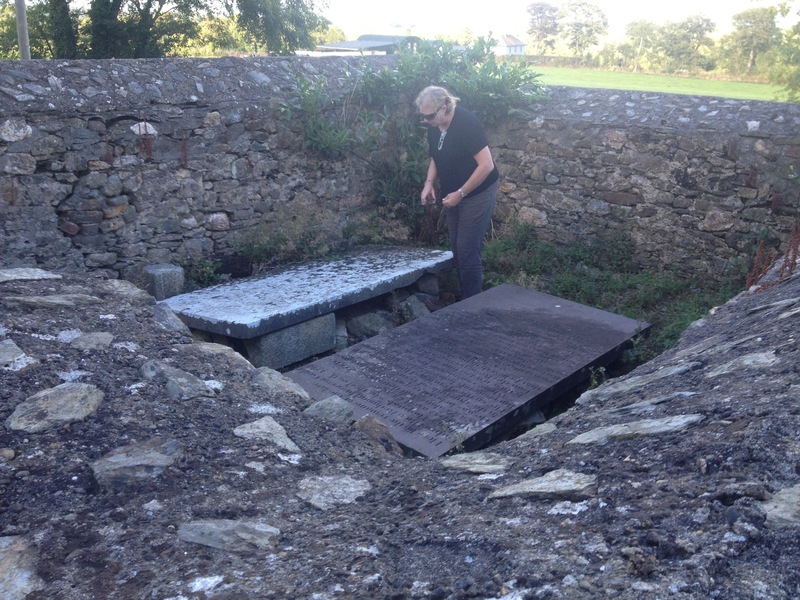 It was a simple matter of climbing a crumbling stone stile into the old graveyard and beginning a grave-by-grave inspection. Practically the last grave at the back left hand side of the cemetery was where Geoff spied the date 1777 on a flat, large granite grave that was covered thickly in moss, soil, stones, twigs and the branches of a low tree. It took ages to clean the graves, and several visits, in an effort to understand the inscriptions, we also pruned the tree back, and washed the entire surface several times with water. 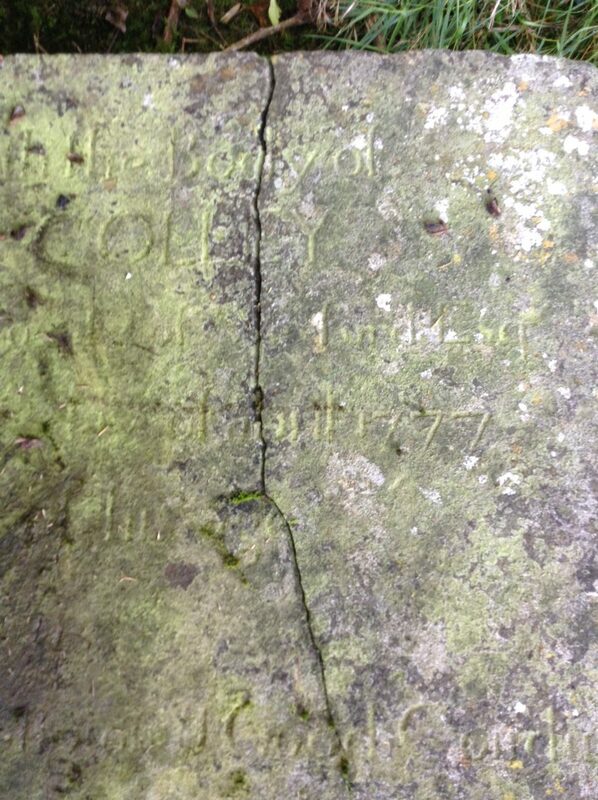 I knew that this was the grave of John Colley by the date alone. Our work had uncovered the Colley grave that Ffrench had described in his book. I think it is now evident that Rev. Ffrench has made an “error in translation” from his fieldwork, to writing up his research in his study at a later date. Easily done at a time when there were no photos to back up his work in the field. of Ballywalter, In County of Wexford Esq. After returning to Sydney I was able to download my photos and enlarge them to view more details and checking the transcriptions. Ffrench stated that they were worn in 1888, so 130 years later they are even more difficult to read, but incredibly, they survive and today they are still amazingly readable. 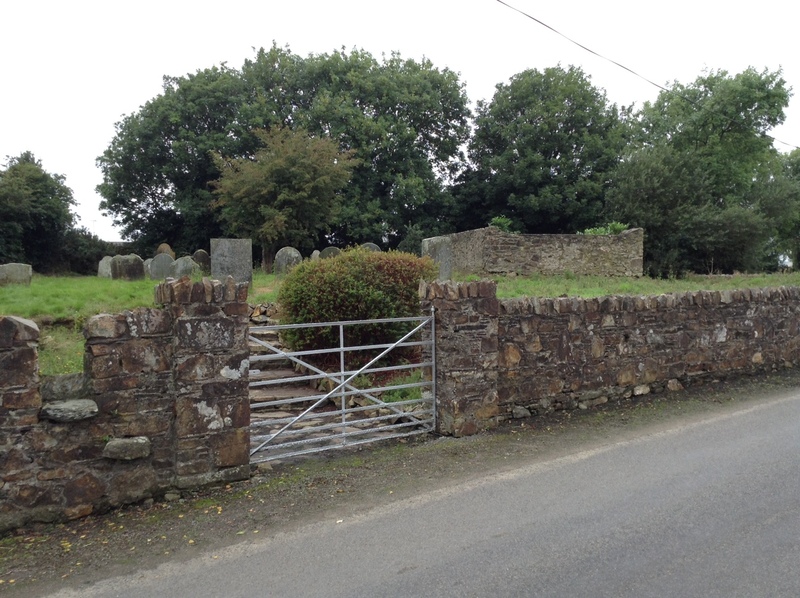 In summary I can now confirm that there are two Colley graves in Melenagh and two Smith/Colley/Brownrigg graves at Ballycanew – all are large flat rectangular ledger graves of black granite, all similar in size. 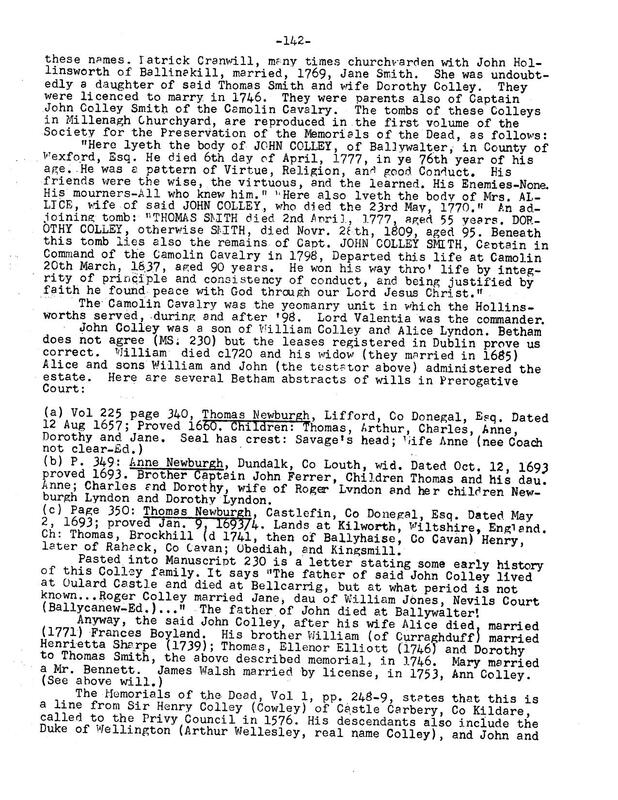 Ffrench had listed John Colley’s grave beside the Smith grave, however I actually found that Thomas Colley is buried beside John Colley and wife Allice at Melenagh. Thomas Colley is probably John’s brother. Did Rev. French ever find Thomas Colley’s ledger grave? He certainly did not write this grave up in his book. My research is complicated by Ffrench’s error in his book. It is not easy to correct the published word, and it has created an unforeseen problem, as I had earlier relied on Ffrench in my earlier research. In support of Ffrench he did an amazing job, and I wish to take nothing away from his research and his publication. I only seek to make an important correction. Rev. Ffrench obviously corresponded with Francis Pentland Colley, who gave information from his visit to Melenagh, after his visit to Wexford in the 1880’s. 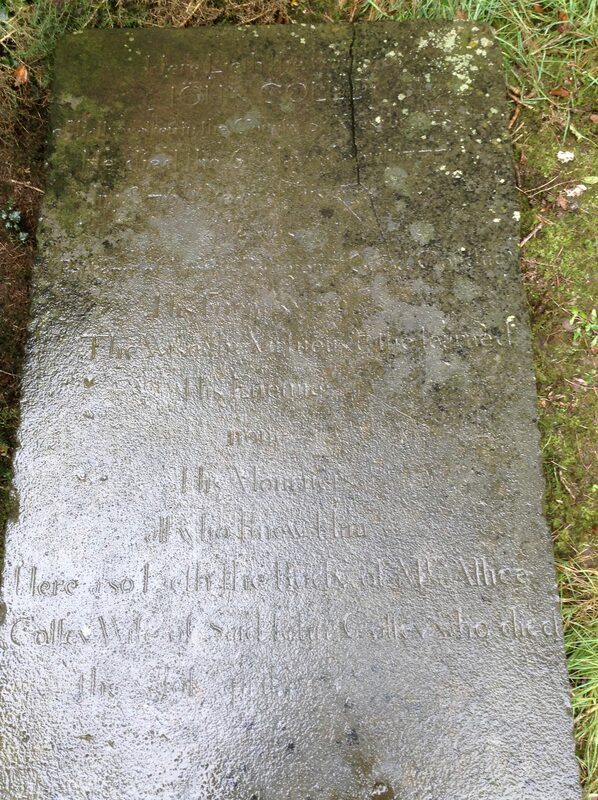 In all probability Francis Pentland Colley would have visited both Melenagh and St Mogue’s graveyards. How Ffrench came to confuse the two graveyards will remain a mystery. 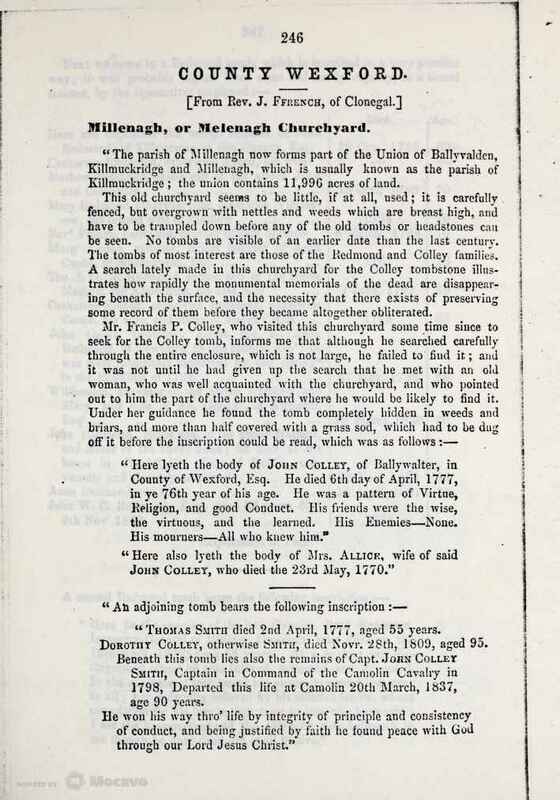 However, it is understandable, knowing that Dorothy Colley was the sister of John Colley, he must have mistakenly recollected that they were buried side by side at Melenagh, after returning home to write up his research. Ffrench had no camera either, so his only references were his memory, his notes, and his correspondence with Francis Pentland Colley. In his chapter on Melenagh/Millenagh Ffrench also outlines the Colley descendant line, taking the family back to Sir Henry Colley of Carbery Castle, who married Catherine Cusack. This is the point where our Colley line shares the same ancestral line as the Duke of Wellington. 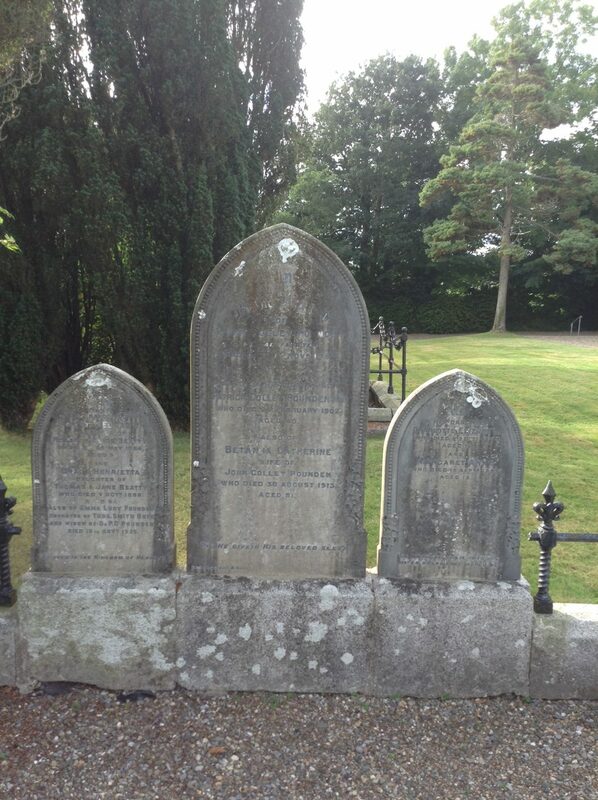 We know now that Thomas and Dorothy Smith are buried at St Mogue’s, Ballycanew in separate ledger graves. It is also intriguing to speculate who are the other people who are buried in the Smith graves at Ballycanew, and we are left to wonder why they are not listed in Ffrench’s book. 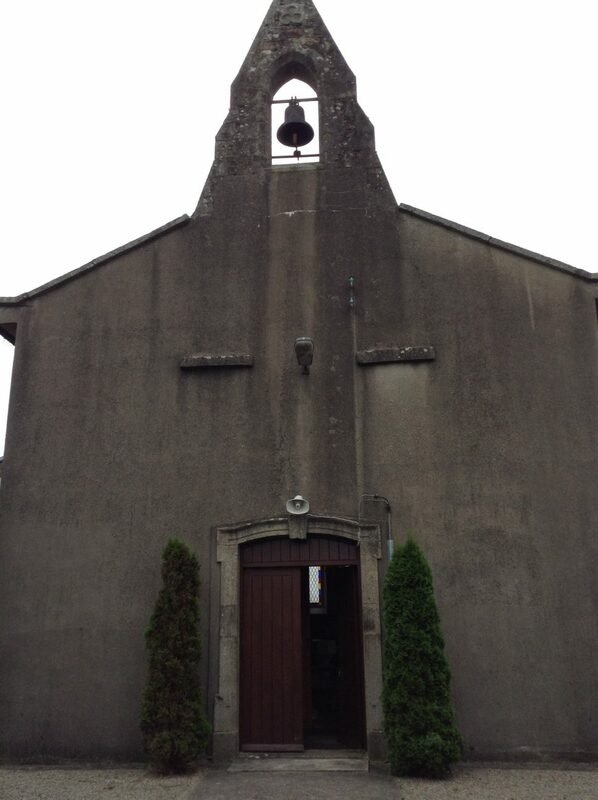 Ffrench must have visited St Mogue’s at Ballycanew because he sketched the font in the graveyard. It would seem that Ffrench’s memory of his visit and his correspondence with Francis Pentland Colley resulted in some sort of confusion, whereby he caused two graveyards to be presented only as the one, Melenagh/Millenagh, in his book. 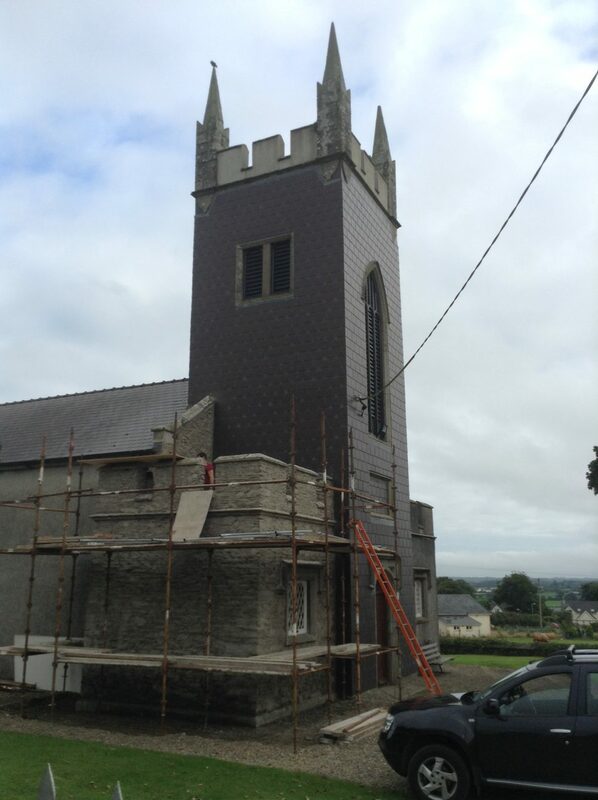 Wally McMahon, a fellow researcher has written several articles over the years on the Cranwill, Johnston and Tackaberry Families who worshipped at St Mogue’s, Ballycanew. It has been a pleasure to collaborate with him over the Cranwills of Wexford. His excellent Discussion Papers are very readable and knowledgeable. However he does not deal fully with my ancestors Dorothy Colley or Thomas Smith. 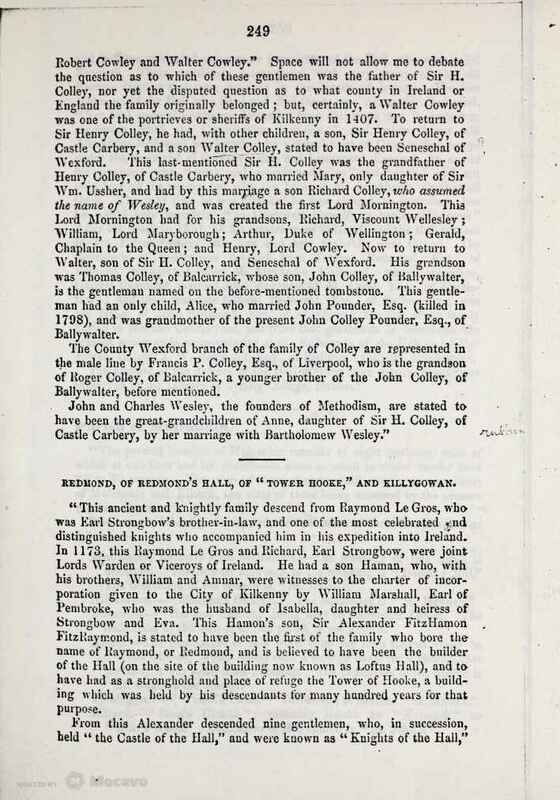 I feel I can now confirm Dorothy Colley otherwise Smith, as a descendant of the Colley family of Carbery Castle, Kildare, and also as the wife of Thomas Smith of Ballyduff, Wexford. 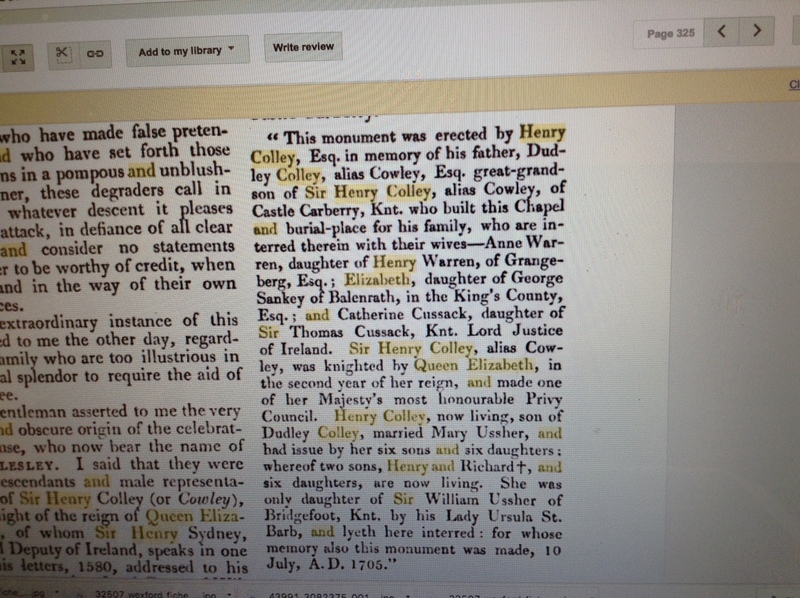 In light of finding and photographing the graves at St Mogues, Ballycanew and Melenagh, I also have other documentation from the Colley descendant line mentioned in the book, Irish Pedigrees, The Origin and Stem of the Irish Nation by John O’Hart, which actually outlines two lines of Colley descent. We are lucky that O’Hart whose primary interest was the Duke of Wellington’s line, saw fit to outline a second descent line, which ends with Dorothy Colley and her siblings. The Colley descent – pages 123 -128, can be seen listed at the end of my online article on The Cranwills and Kilpatricks of Dublin. 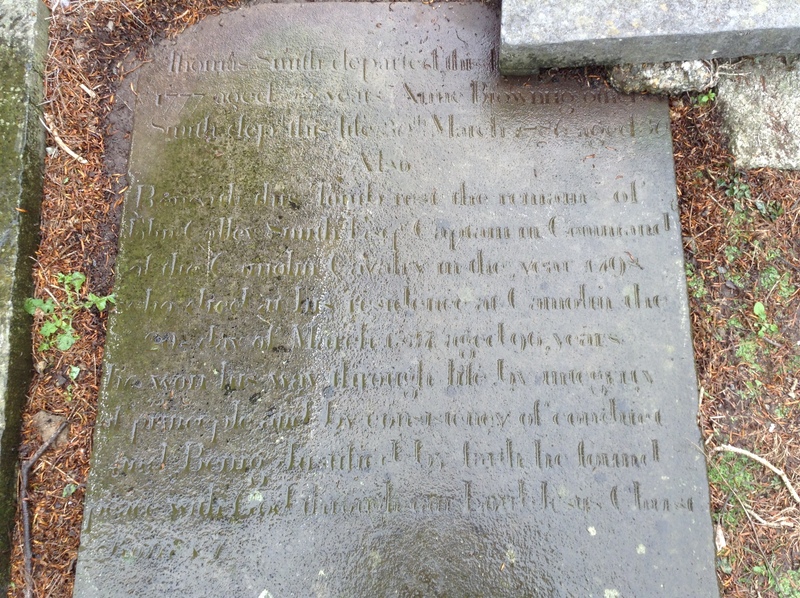 The fact that Dorothy Colley otherwise Smith, and Thomas Smith are buried at St Mogue’s, Ballycanew in side by side ledger graves, and the supporting connections of Rev. 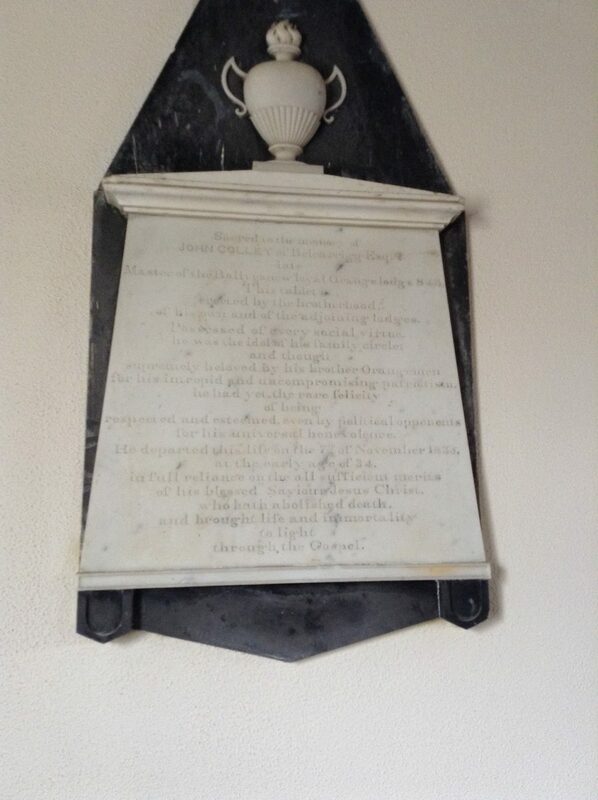 Arthur Colley to St Mogues Church at Ballycanew is quite significant, and also now my finding and transcribing the plaque dedicated to his eldest John Colley Esq on the north wall of St Mogue’s Church at Ballycanew. Ffrench recognised that the Colley and Brown graves were an important and historical grave site, and one that needed to be documented before the were lost to history. I also considered this to be my primary reason for my trip to Melenagh. The photographing and recording of the grave inscriptions was paramount. Geoff and I were also respectful of the graves and only used water on the surface, after brooming off the dirt, moss, stones and twigs. I am proud that it took a Sydney girl to travel to Wexford in Ireland and document these graves for posterity and our family. 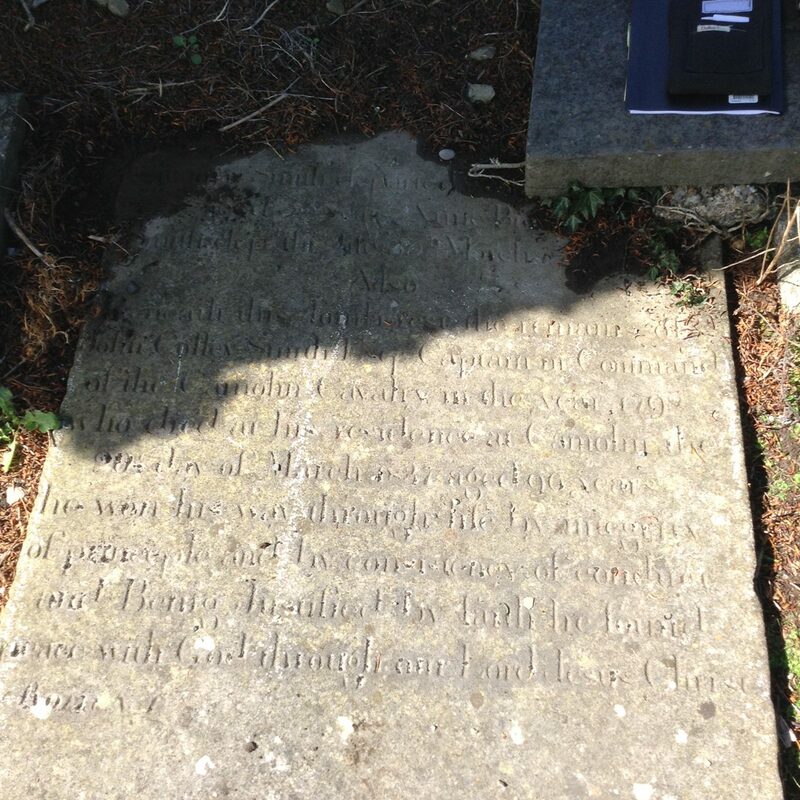 Photo shows Virginia cleaning John Colley’s ledger grave at Melenagh, as well as showing earlier tree pruning, to enable the grave inscription to be carefully transcribed and photographed. We actually visited Melenagh and St Mogues graveyards twice, the 5th and the 6th September 2016, to photograph and record, and to make sure we missed no other details. I wanted to take photographs of the graves when they were dry, hence our return on the 6th September. However, it soon became obvious that the dry ledger graves had less definition to the naked eye, and made the inscriptions more difficult to read. Geoff and I then rewashed the graves and took further photos. The 6th September was a cloudy day, and this also helped the photography as there was far less glare. As I was expecting, the Redmond ledger graves were enclosed in a tomb at the Melenagh graveyard, which is surrounded by a stone wall. The entry is by way of an opening towards the back of the tomb, which allowed me to access to the graves. One is quite readable and looks almost unscathed by time; the other is covered in lichen and unreadable. 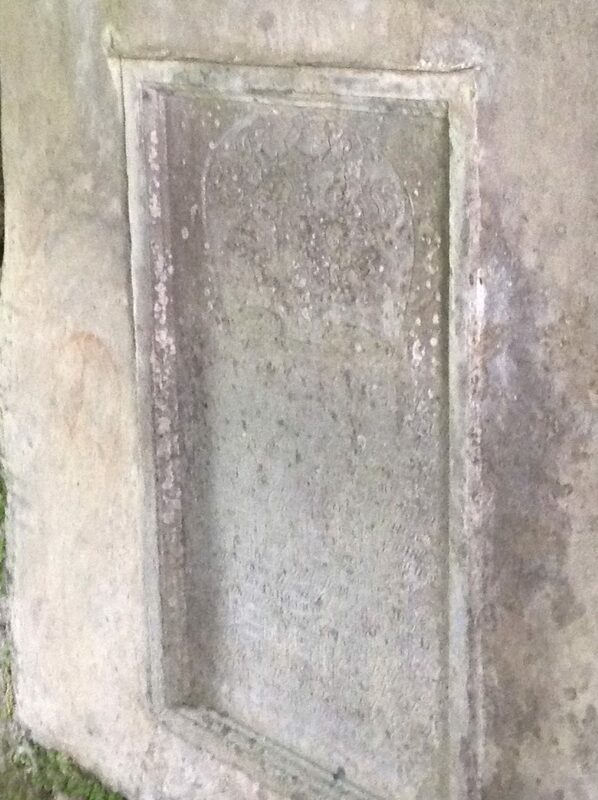 It was not possible to even try to remove this to uncover the inscription, as it would risk damaging the grave. We will have to rely on the Rev Ffrench for his nearly 130 year old transcription. 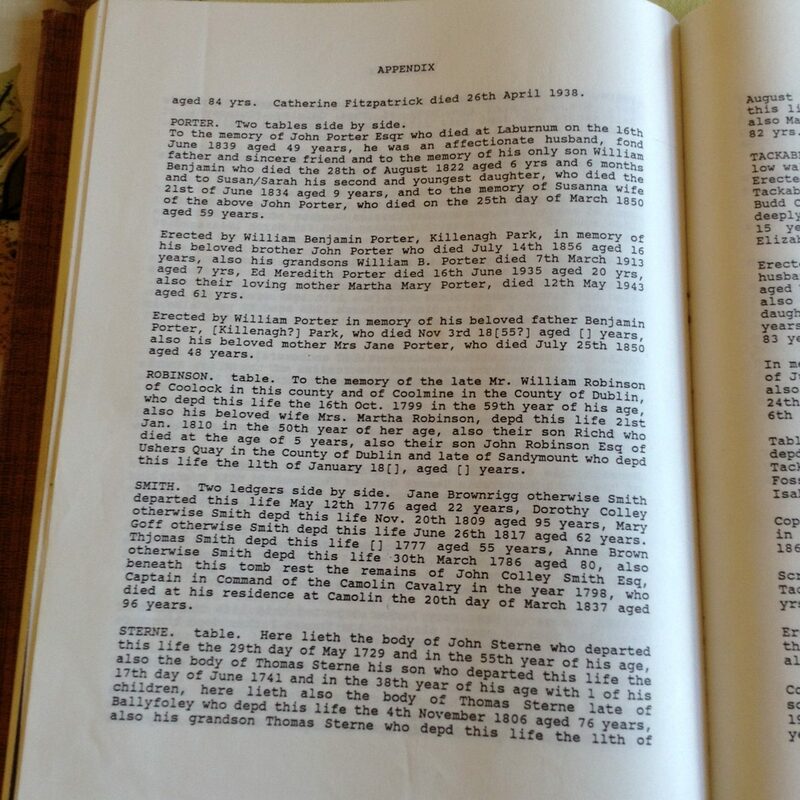 On the following page I have reproduced Ffrench’s transcriptions of the two Redmond ledger graves. 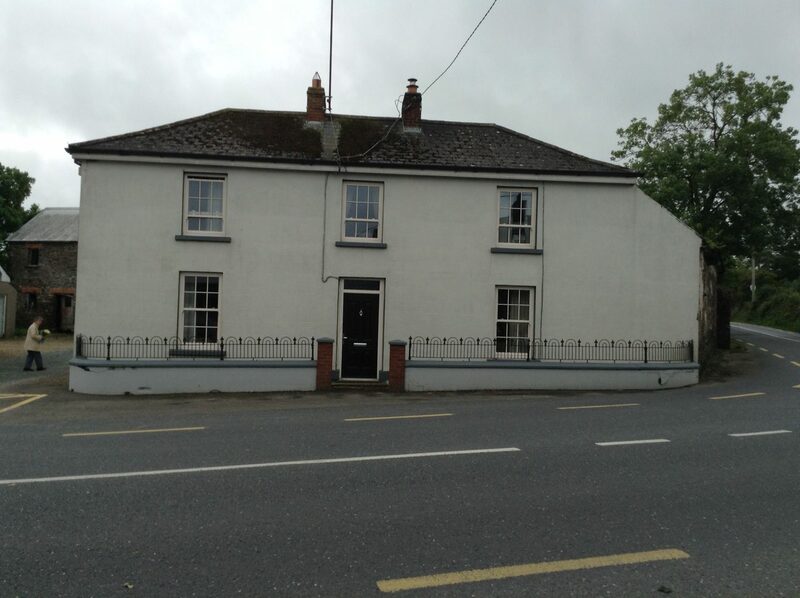 Geoff and I also visited several townships in Wexford known to have been connected to our Colley, Cranwill and Smith families, and extended branches including that of the Pounden family, ancestors of John Colley who was buried at Melenagh in 1777. 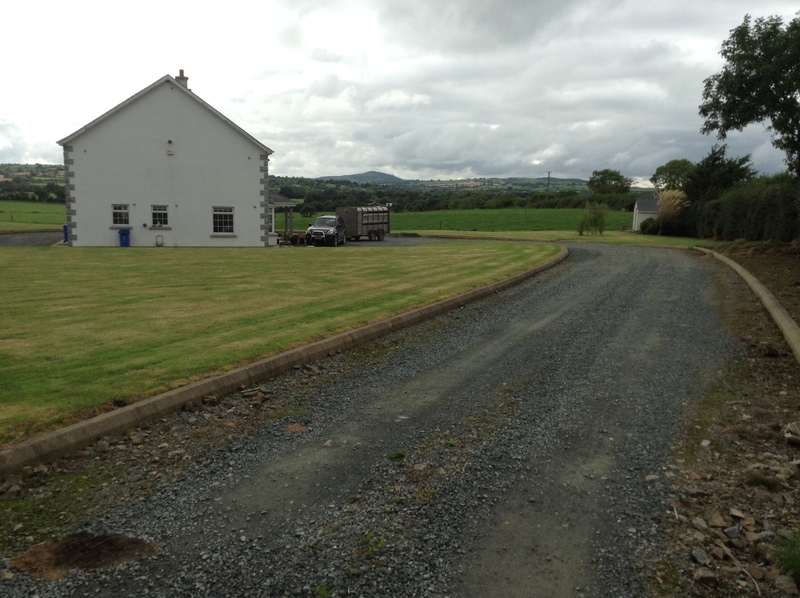 We went to Ballywalter, Ballinamony, Tomduff, Ballyduff, Camolin, Clonevan, Monamolin and Belcarrigg. Ballywalter was a delightful drive past a river and valley and then up onto a hill where a large outcrop of buildings appeared. Very old walls and barns were attached to an old home. 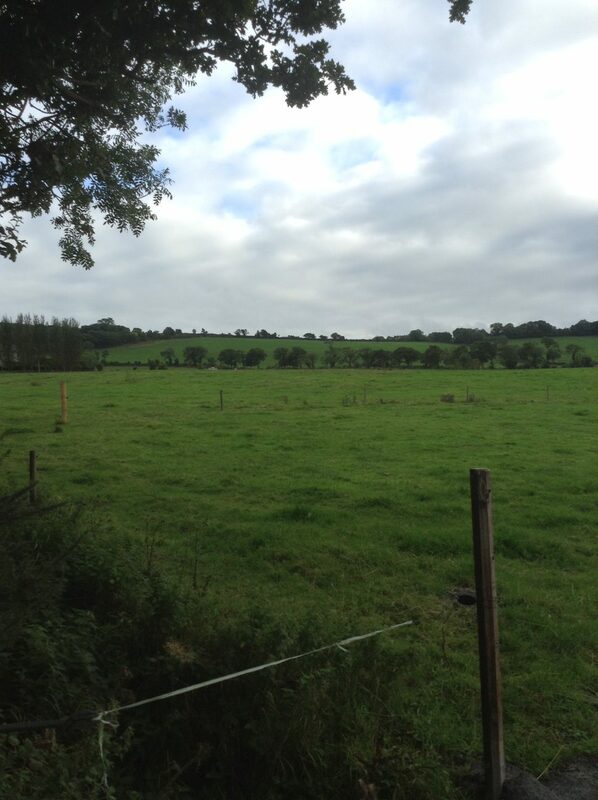 Not far from Melenagh were the lands looking towards Ballyduff, however we were unable to find any entrance to the surrounding area. 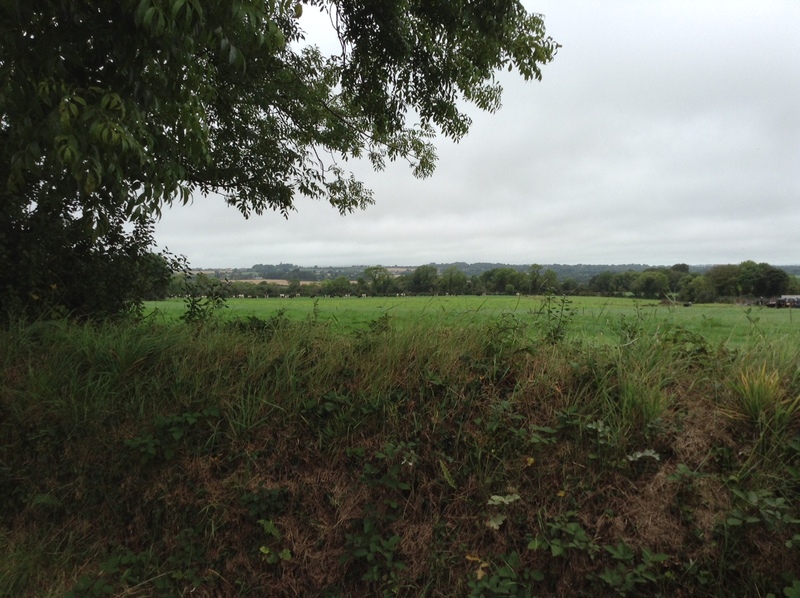 Farm lands looking towards Ballyduff, Wexford, Ireland, home of the Smiths. 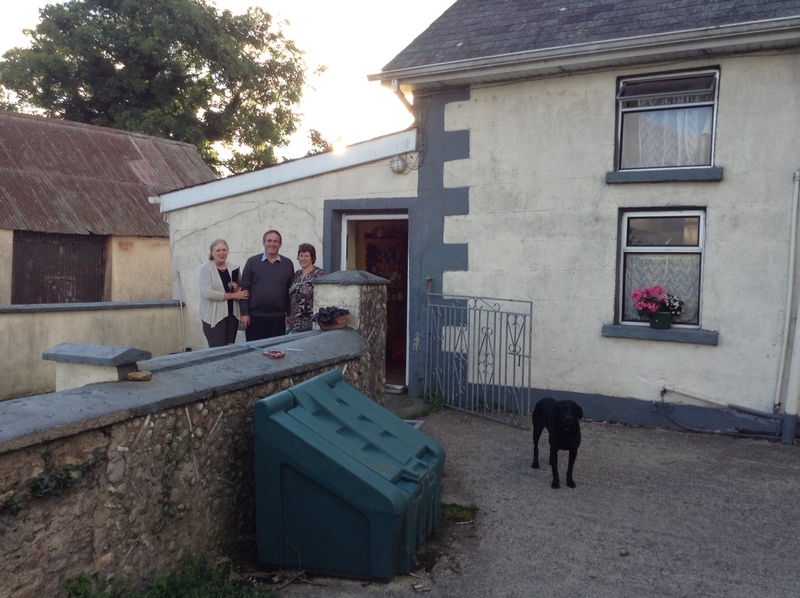 At Ballynamony we were delightfully welcomed into the old Cranwill home by the Doyle family, who were fascinated by my story about the Cranwill and Colley families, and document describing their lands in the Frances Johnston/Thomas Smith Cranwill dowry/marriage agreement of 1801, drawn up by their fathers, Patt Cranwill and William Johnston. 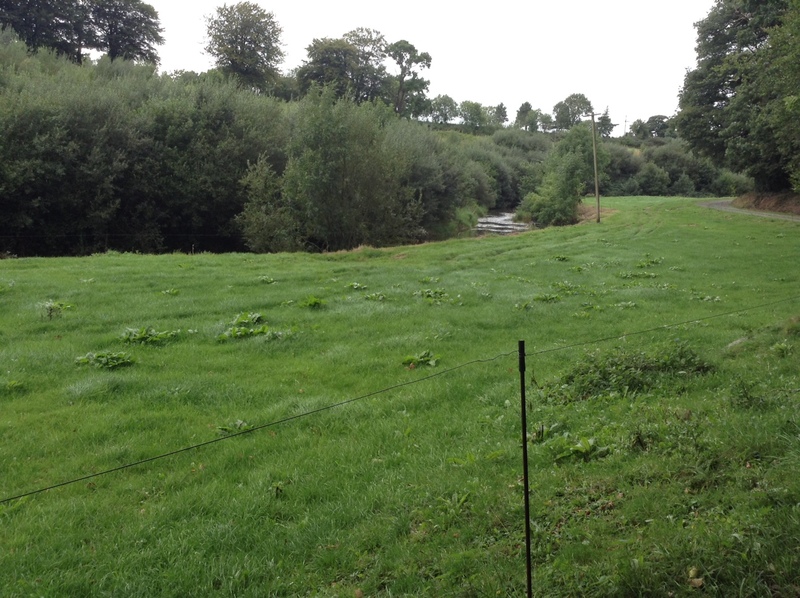 The lands surrounding this area matched the map that was excitedly produced of their farm, and Denis and Ann Doyle very kindly allowed me to take photos. It was quite an experience to meet with the family and exchange our family history. Ann Doyle’s family had lived in the home since 1912. When Geoff and I were in Dublin we visited the Registry of Deeds at Henrietta Street. We walked down to the River Liffey and amid the busy city we saw the rebuilt Four Courts Building, which stands beside the river. The earlier building had been spectacularly blown up in 1922 during a siege in the early stages of the IRA war. The English knew of a plot, and, suspecting gun powder was being held in the bowels of the building, without thinking about what they were doing, or the repercussions, they bombed it and its contents burned, and with it went most of Ireland’s birth, death, marriage, wills and census records. At the time, the Registry of Deeds had been relocated, and it is incredible that these documents survive, and that some of them relate to our family, they are very precious indeed. 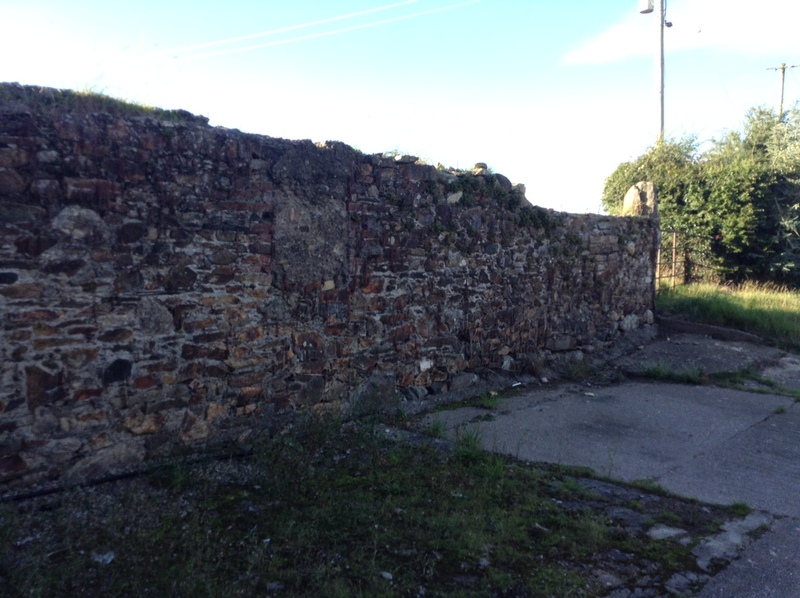 One of the surviving documents is that of the dowry/marriage agreement of the Cranwills and Johnstons, these families are prominent in Ballycanew and worshipped at St Mogues, having pews allocated to them as a matter of status. On one of our day trips around Wexford I spied the town of Clonevan, and remembered that this was a familiar placename. A quick look through the cemetery soon found me photographing the Pounden grave. John Colley Pounden was the grandson of Alice Colley, the daughter of John Colley, who died in 1777 and is buried at Meelnagh. John Colley was 70 years of age when his daughter Alice was born. A year earlier his first wife Alice had died, and he married a Miss Boland who was the mother of Alice Colley. Tragically Miss Boland/Mrs Colley died in childbirth, and seven years later her husband, John Colley died. The orphaned Alice Colley became an heiress, being left the lands of Ballywalter. When Alice married John Pounden Esq in July 1786, her address was given as Ballywater (sic), where they subsequently lived. This marriage record does not survive however a marriage notice was placed in the Walker’s Hibernian Magazine and is a wonderful record of their marriage. Whilst Geoff and I were at the Registry of Deeds, we looked up as many of the old Registers as possible in the short time we were in Dublin. It is mired in a system of red tape, whereby camera’s cannot be used, and documents, if you can find them, are expensive to purchase. Their only contribution to the modern era was spy cameras on every ceiling. 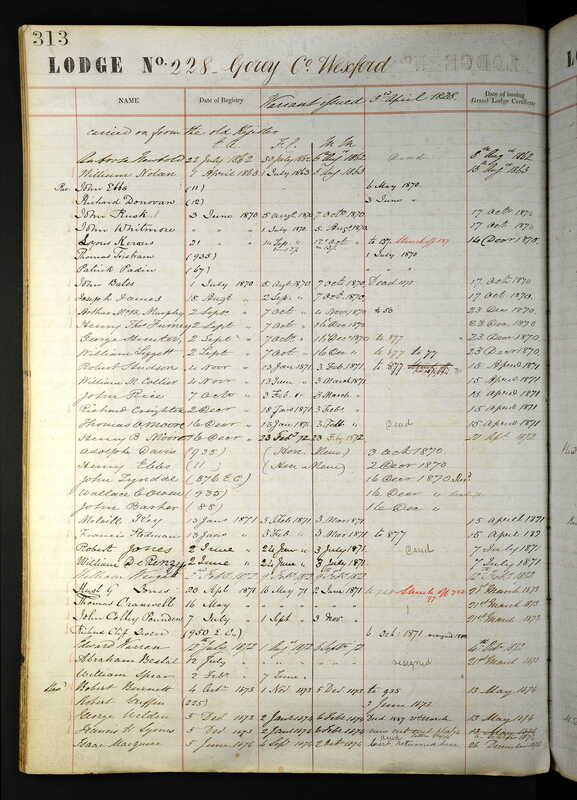 The system is complex – an index lists the names of those listed in the deed documents, from this large and heavy index one makes your way to another room to view the transcribed documents. These are hand copied, and are contained in enormous canvas covered books. If you find the relevant document they can ordered, sight unseen, for the princely sum of 20 Euros. This document is then posted to you. I ordered four documents and was surprised when they arrived in a flimsy A4 envelope, folded into many uneven layers. It was an interesting but unimpressive operation from start to finish. A document I spied at the eleventh hour, as I was packing away the indexes was named Cranwell to Cranwell (sic). 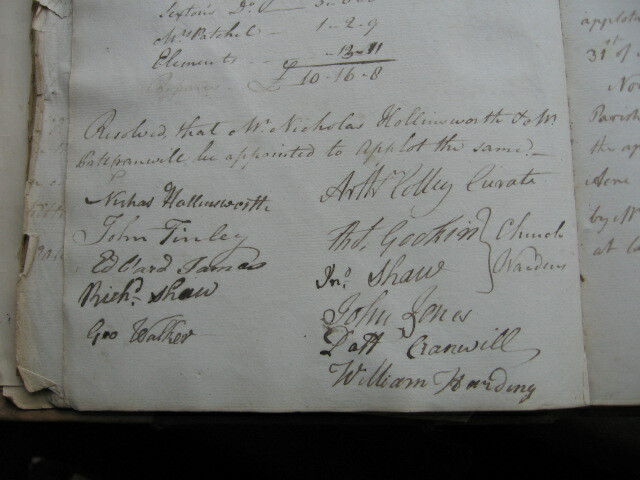 I decided on a whim to purchase it, as well as three others, and was rewarded with a document recording Patt Cranwill and Thomas Colley Smith signatures on the same document, thus further cementing the relationship between these two families. My first impression was to see it was a deed of land agreements for rent. It was exciting to see Patt Cranwill’s signature again and to see that this signature is the same as that on the Johnston/Cranwill Marriage Agreement, and the documents are 30 years apart. It is also comparable to the signature that can be found on various pages of the St Mogue’s, Ballycanew, Church Register. My second impression was how exciting it was to have two signatures, one of Patt Cranwill and the other of John Colley Smith on the same document. The document dates from 22 July 1773. 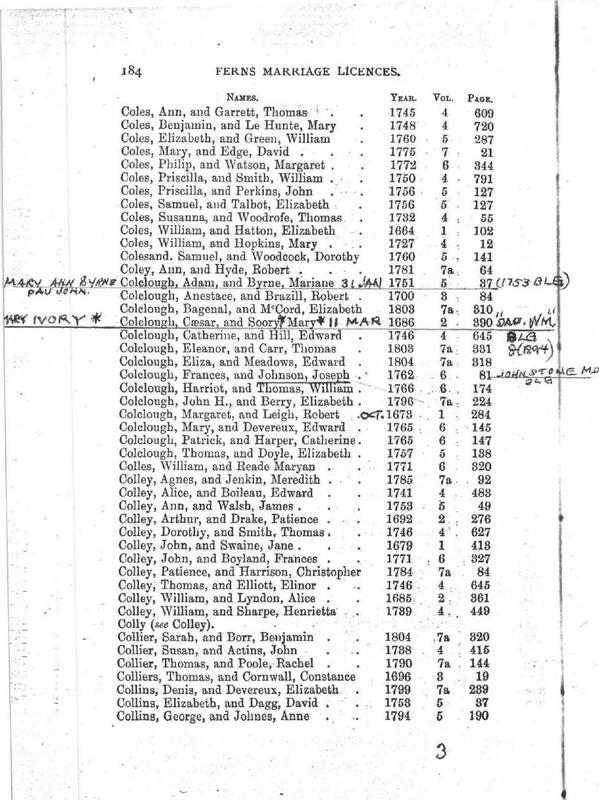 When I collected this document from ancestry.com recently, I was fascinated to see that Thomas Cranwill and John Colley Pounden were listed together. This shows that these families were all interconnecting in Wexford, and they would have known that they shared a great and close family connection. 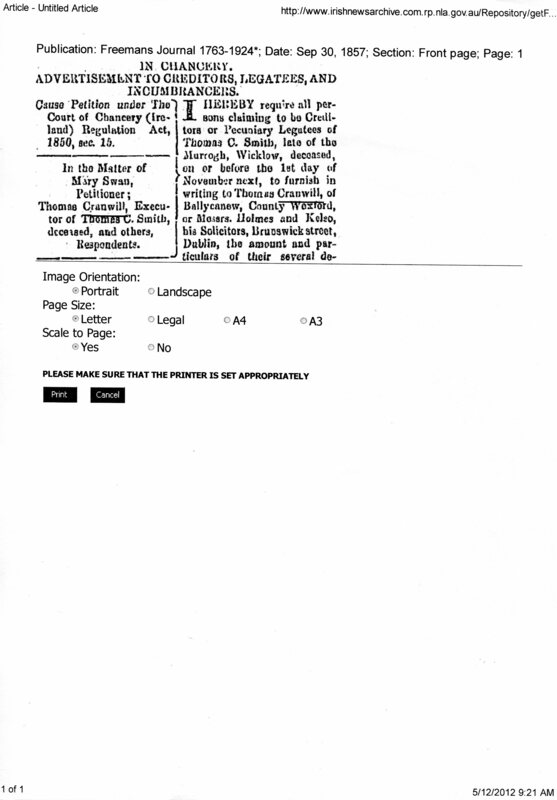 Indeed Thomas was an executor on his uncle Thomas Colley Smith’s will in 1857. 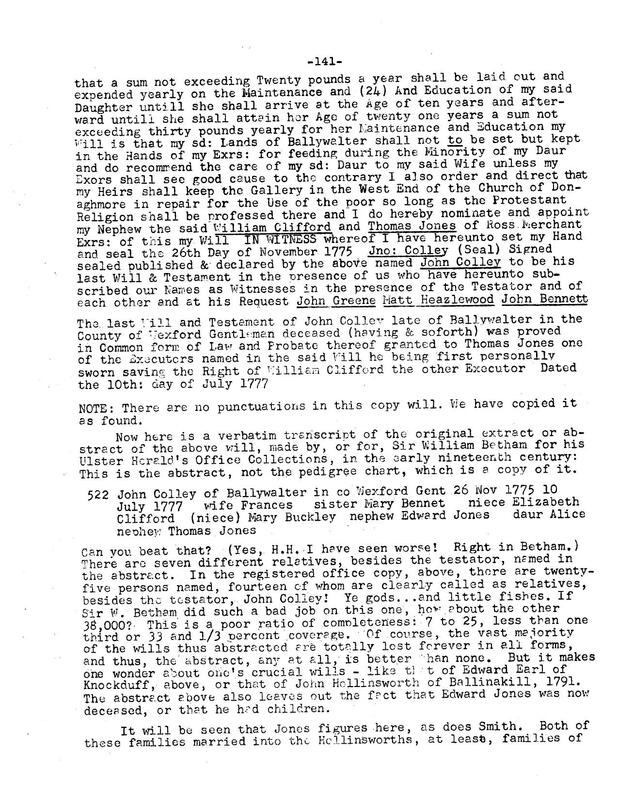 It is exciting to find documents where the Colley, Smith and Pounden families are interconnecting. Earlier in our trip to Ireland Geoff and I drove through Kildare, determined to find Carbery Castle, reputedly the home of the Colley family. Many family trees record the Colley family descendant line, and thanks have to go to our most illustrious “cousin” the Duke of Wellington whose many admirers traced his lineage. Some even did our line, a secondary descendant branch to the Duke’s, and for this we must be very grateful. We arrived at the Castle gates and after acquainting ourselves at the local pub where we were most generously welcomed, we climbed the hill to the castle. There is no other way possible, and we were lucky yet again to have the most amazing weather for this adventure. I took a lot of photos of the graveyard, more work needs to be done to work out these Colleys buried here. Carbery Castle is long disused, and a view across the valley shows the Georgian home that the Colley family moved to after they abandoned the old Castle. 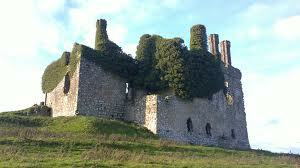 The roof was removed due to the “roof tax” levied on all buildings in Ireland, and thus many castles and old homes have fallen into disrepair. 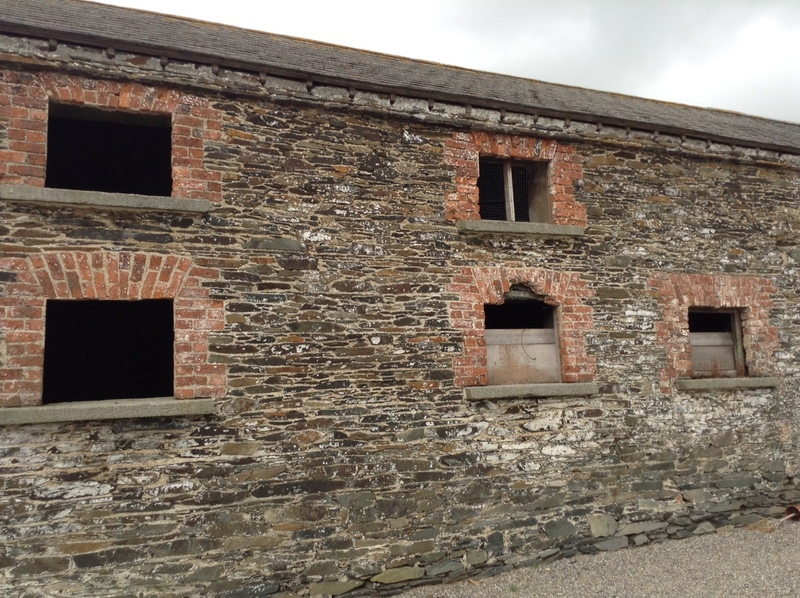 According to locals all the lead and copper from the castle was stripped off and reused in the new Colley home. I was able to photograph this Colley Memorial from an open window at the back of mausoleum, unfortunately I could get no closer to read the inscription. However, it is undercover, and it is well protected from both the elements and possible vandalism. My thoughts were that somewhere I would be able to find a transcription of this plaque. Just today I undertook this task, and found an old dusty document uploaded to the internet from 1805 called The Gentleman’s Magazine, 1822, page 325 with a full transcription and other interesting reading describing their linage, and the family’s association with Queen Elizabeth I and the bestowal of a baronial knighthood. 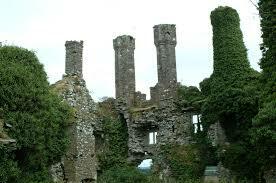 Nearby to the Colley family mausoleum are the ruins of Carbery Church, less than 100 metres from Carbery Castle. Today only of one wall remains standing, and here I found this plaque in the shape of a shield, which I could barely read, however one word stood out for me, the name Colley. The crest remains, however it is exposed to the elements and is badly weathered and partly covered in moss and lichen. Carbery Mausoleum with Church wall back left where a plaque can be seen on the wall. 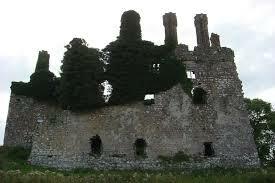 This photo shows how overgrown the castle is, with cattle often grazing amongst the walls. 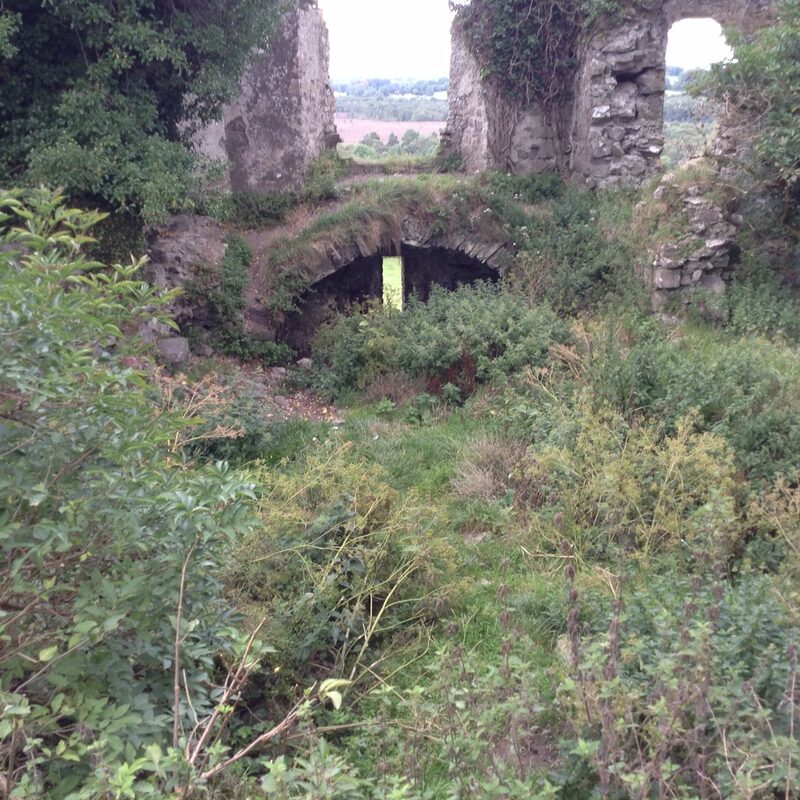 An old stone archway leads to an archer’s window. 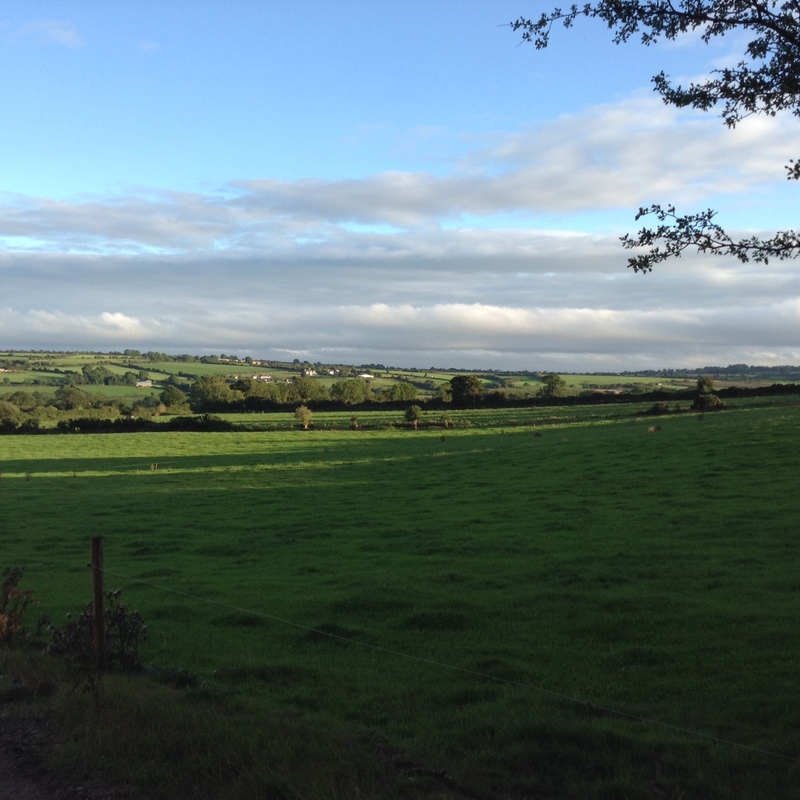 The views of the surrounding county are expansive. Following my visit to Ireland I contacted both Wally McMahon and Tom Hollingsworth. 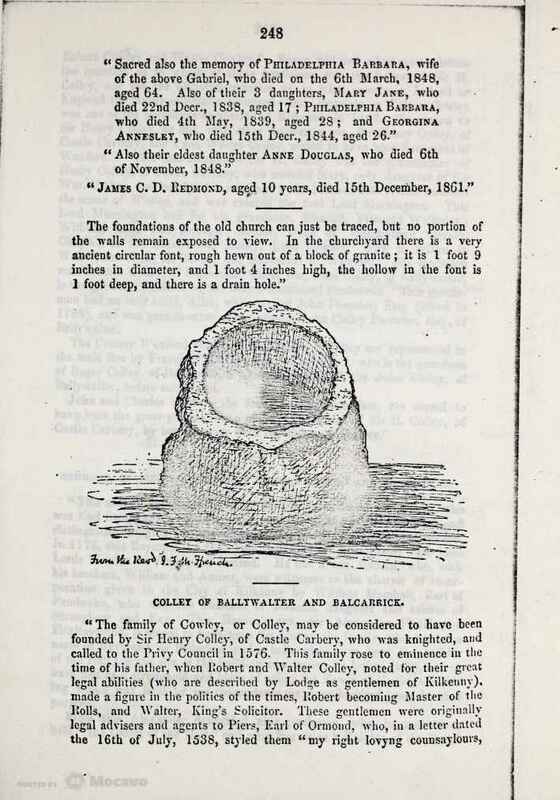 In January this year Wally updated his research paper on Ballycanew to reflect my discoveries and accepted my research regarding Dorothy Colley being a descendant of the Colleys of Carbery Castle, which I appreciated. Tom Hollingsworth who is related to the Cranwills through Thomas Smith Cranwill Snr’s eldest sister Jane, also was excited by my discoveries that supported earlier research from another branch of his Hollingsworth family, written by Harry Hollingsworth back in 1972. 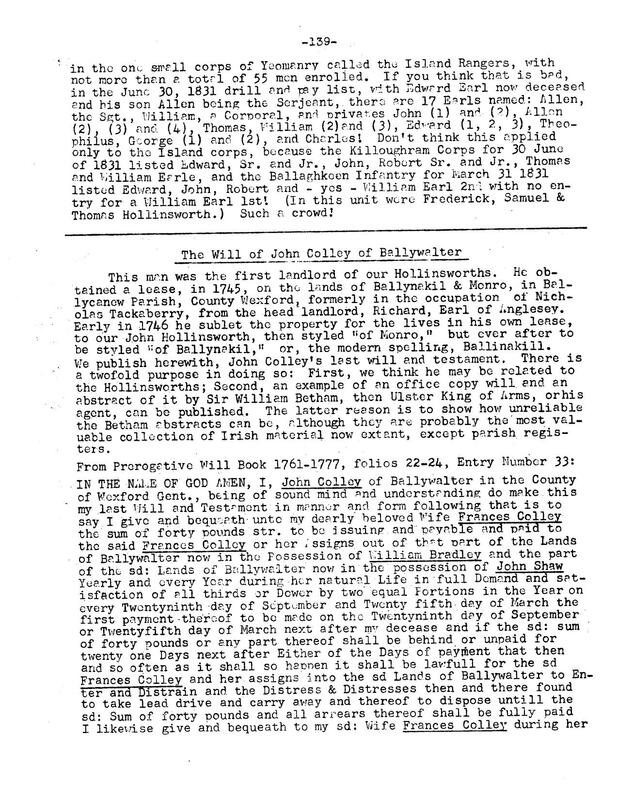 Incredibly Harry Hollingsworth transcribed the will of John Colley’s dated 1777. 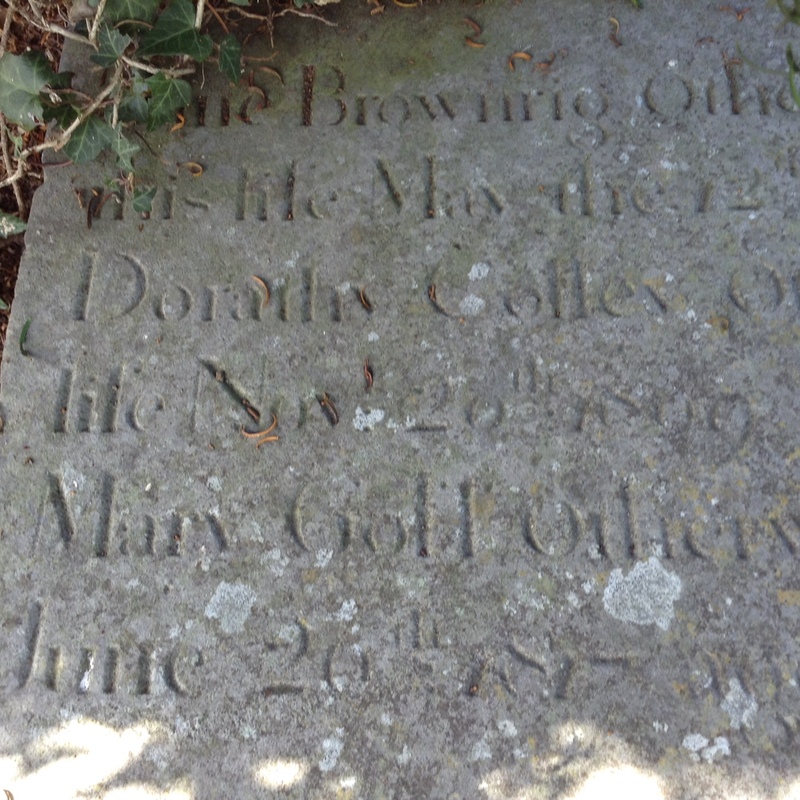 John Colley was the brother of Dorothy Colley, and it is his grave that I found at Melenagh graveyard. 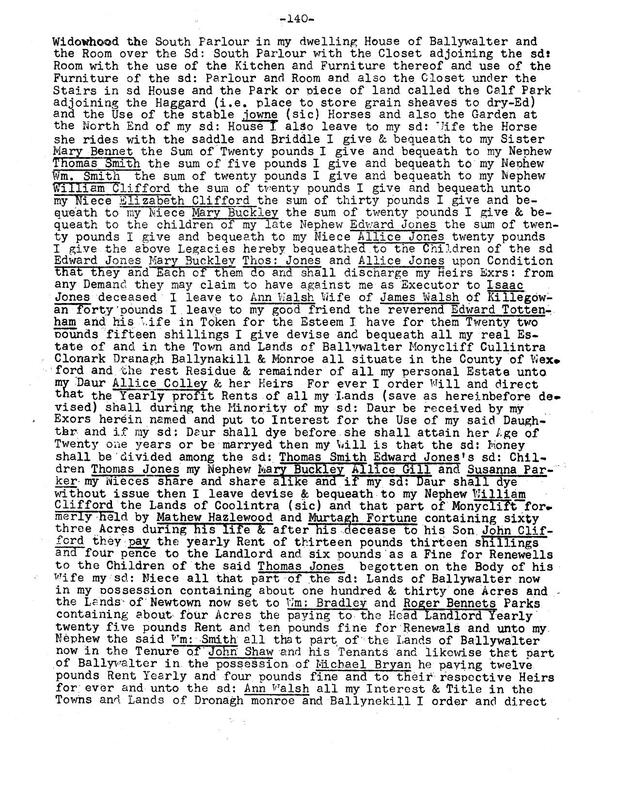 Tom Hollingsworth purchased the Hollingsworth Newsletters a few years ago and has kindly given me permission to reproduce portions of the Newsletters that are relevant to our Cranwill family. 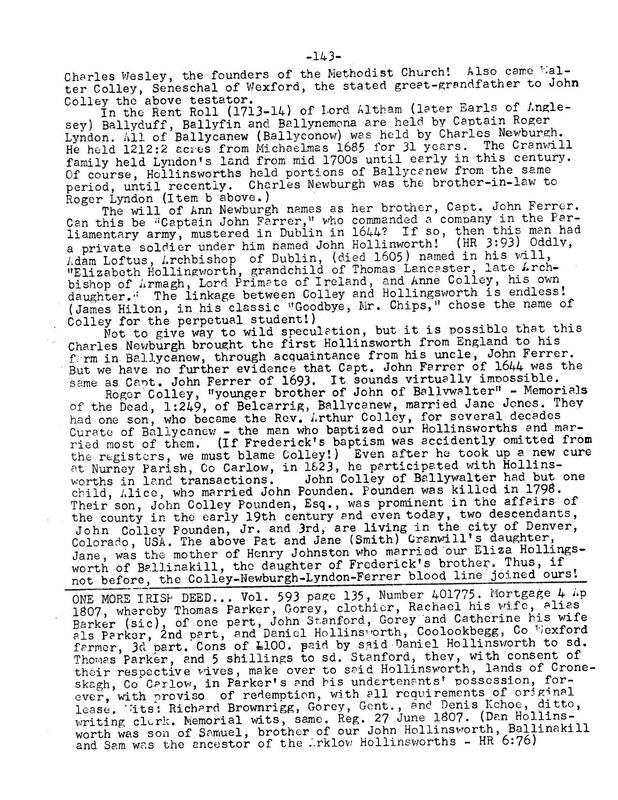 The connections that Harry Hollingsworth has drawn parallel my own findings and separately we have both come to the conclusion that our family line comes down from the noble house of Newburgh, which I have discovered have connections to the Royal families of England and France. 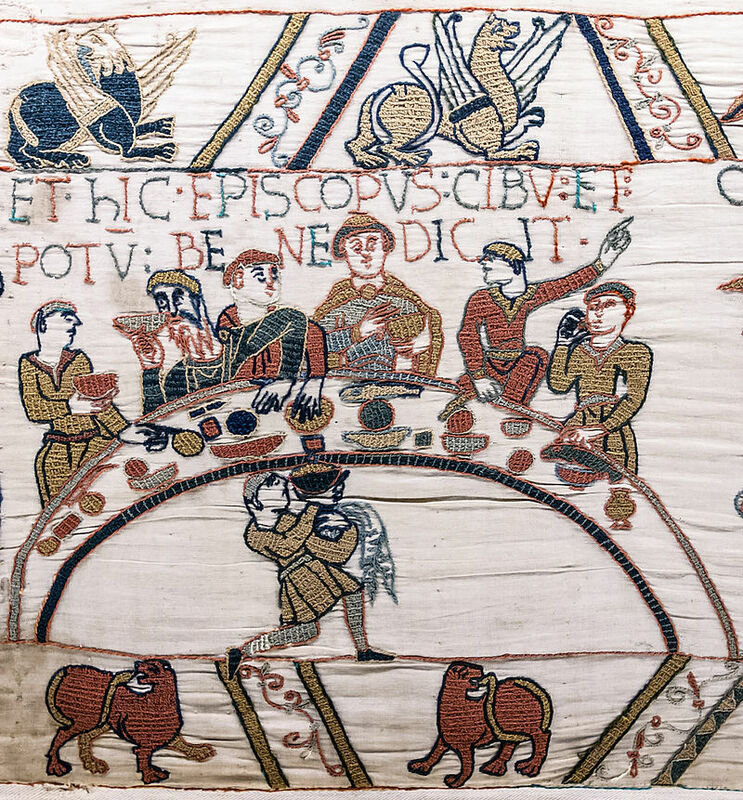 A direct line can be established for the Newburgh family back to William the Conqueror. This line has been thoroughly researched by many genealogists through the centuries and takes the Newburgh family back to Northern Ireland and England. This tree is a helpful document in taking our family back to the Bayeux Tapestry and is all historically chronicled over centuries. 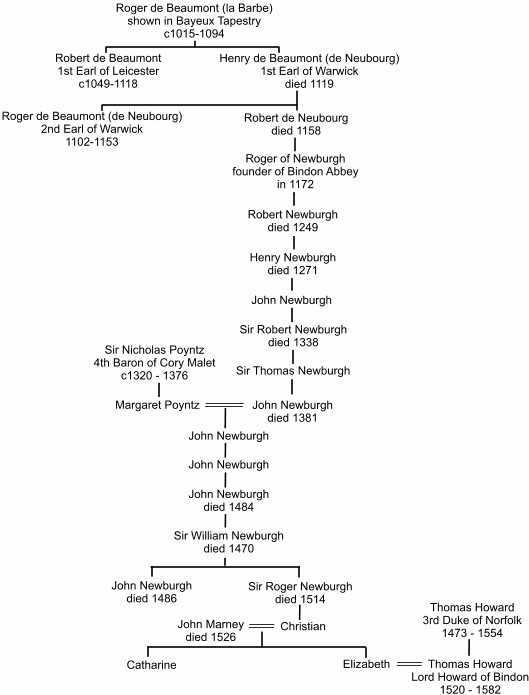 On the next page I have taken my descendant line off ancestry.com to show how our family then descends from John Newburgh and Margaret Poyntz. Then another line from William the Conqueror to John Newburgh, the son of John Newburgh and Margaret Poyntz. daughter of Thomas Newburgh Lieut. Col. M.P. For now this is where my update on the Newburgh, Colley, Cranwill, Smith and Pounden families end. 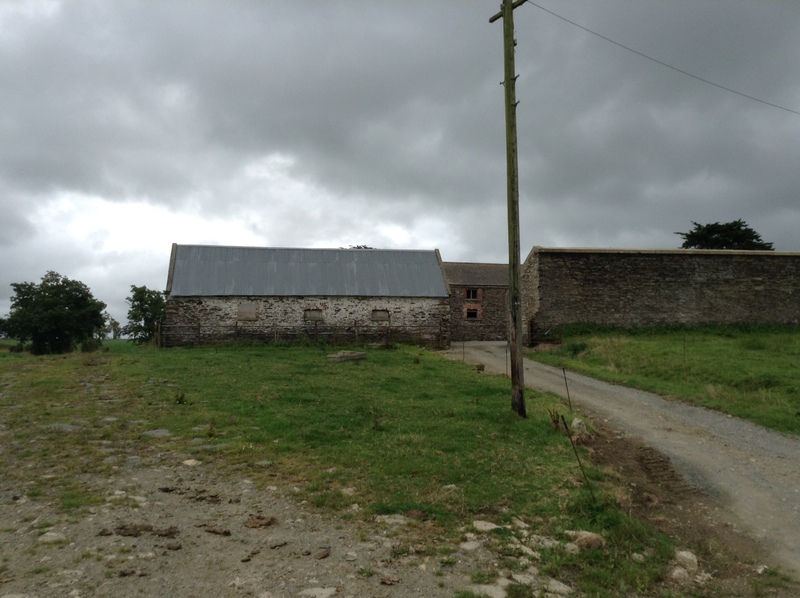 It also includes information on my field research, and holiday to Ireland in September 2016. I will in time be uploading this chapter to my website in an effort to help other Colley, Cranwill, Smith and Pounden researchers and hope that with collaboration we can further establish our Irish ancestors. Really enjoyed your post. I don’t know if u are aware that the memorials in the registry of deeds are now online on family search website. I’ve just come across your fantastic website whilst just ‘googling’ the name Cranwill. Unfortunately, I have not been able to continue with genealogy for the past year or so due to my husbands sudden illness but just thought I would do a search to see if I could find anything new and I came across your site. 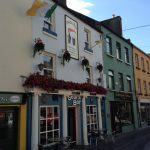 It’s great to see all your photos and research from your trip to Ireland in 2016 and I very much appreciate that you have uploaded all this info. I have just recently taken an DNA test which I am just trying to get my head around! I have come up with a match for a descendant of Patrick Cranwill which is very encouraging. I see you are also a 26th great granddaughter of William the Conqueror – so am I but from a totally different line, small world! 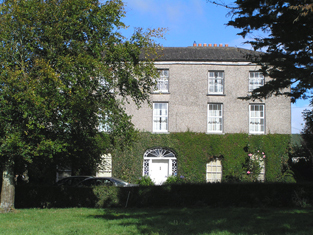 I have been interested in the Colley family because my family were in Balcarrig at the 1798. Mathew Fitzsimons was a tanner there and some of the family deeds were witnessed by Arthur Colley when they moved to Tomcoyle. He was a churchwarden in Ballycanew in 1801 and attended a vestry meeting in 1807. They changed to Leskinfere sometime after this. He probably named his second son after Meredith Jenkin, married to Agnes Colley in 1785, and there is a letter in the “War in Wexford” from Jenkin to John Colley Smith that mentions Mathew Fitzsimons. 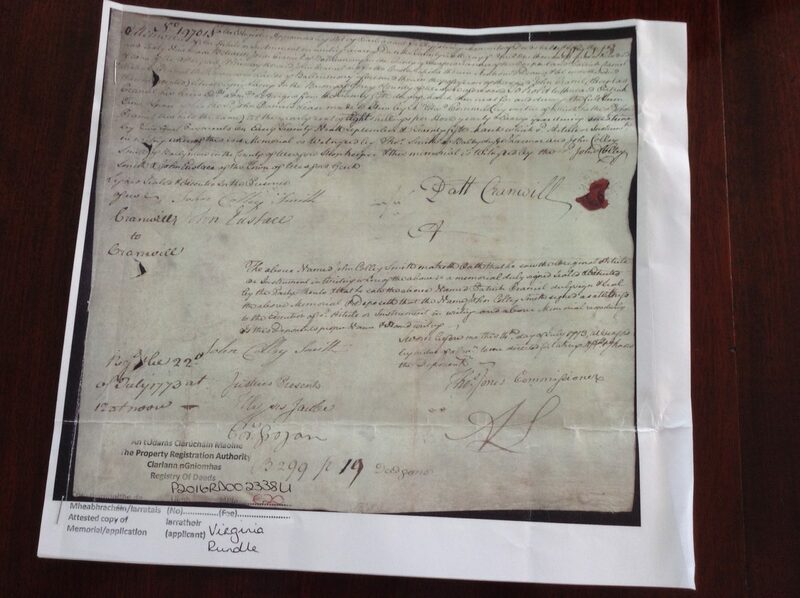 Most of those mentioned in the letter are relations – Harrisons, Cranwills etc. Mathew Fitzsimons and John Colley Smith were at the formation of the Ballycanew Brunswick Club in 1828 as reported in newspapers.